Traveling through Southeast Asia seems to be the most popular journey to make for people in their twenties! And who wouldn’t agree with them. The possibilities in Southeast Asia are endless, and you got a lot of worth for your money. Backpacking around Southeast Asia has never been as easy as now, buses, visa agencies, tour guides, everything is available within a 100m of your hostel it seems. When thinking about backpacking Southeast Asia a trip could be as short as two weeks, or as long as a year. 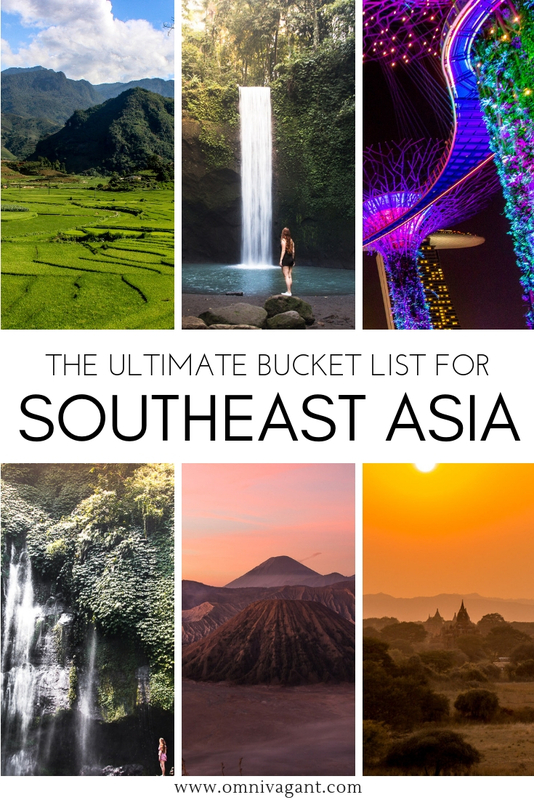 There is so much to see and to do, and to make sure you don’t miss out on anything find here the ultimate Southeast Asia bucket list! Indonesia is not only Southeast Asia’s largest country, it is also home to Southeast Asia’s largest city, Jakarta. But large and bustling cities is not what this beautiful country is known for. 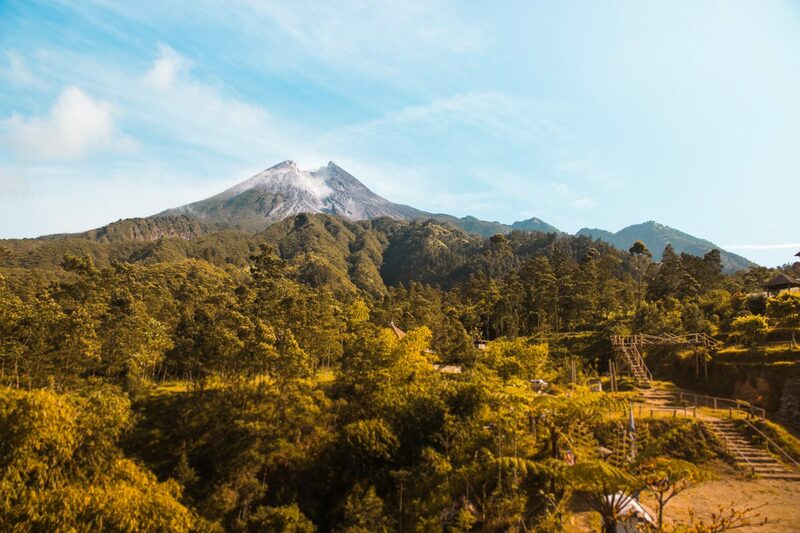 Indonesia is known for it’s diverse landscapes, filled with volcanoes and waterfalls, for the stunning beaches and stunning temples, and don’t forget about the delicious Indonesian cuisine. There is something to see and to do for anyone in Indonesia. For the tourist and the travelers, for the off the beaten path backpackers, here are the things that should be on your Southeast Asia Bucket List. Mount Bromo is a dream come true for any adventure lover out there. Mount Bromo is located on Eastern Java, and mimics an out of this world like landscape due to the fine desert of sand and stunning volcanoes. Climb the hill in the darkness of night to admire the sun rise early in the morning and watch the sky turn from a dark blue to a warm pink and golden yellow. 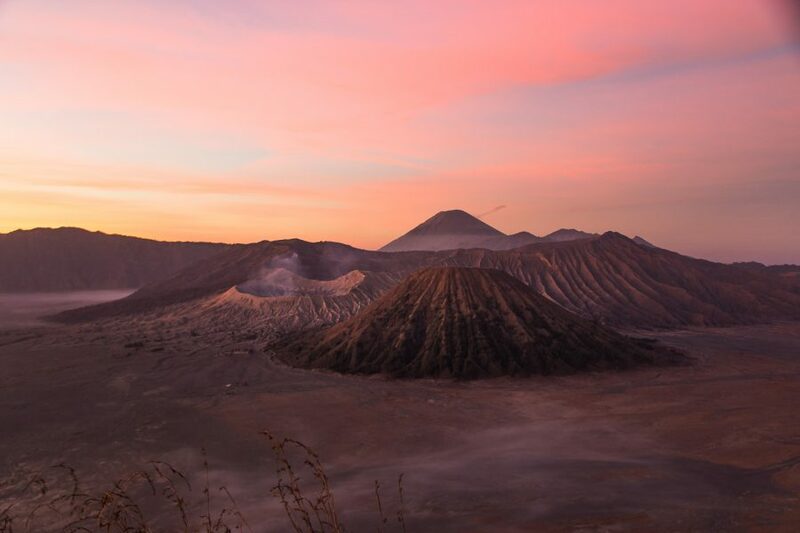 After that, the adventure is not over yet, head down the hill and cross the sea of sands to climb Mount Bromo itself and stand on the rim of the crater to admire the volcano from up close. Mount Bromo is a true adventure for anyone willing to experience it, and definitely should be on your Indonesia Bucket List! Interested in going? Be sure to read our guide on how to visit Mount Bromo for free! In the centre of Java you can find the city of Yogyakarta, one of Indonesia’s most well known cities for tourist and travelers. The city is filled with temples, palaces, and surrounded by stunning nature. 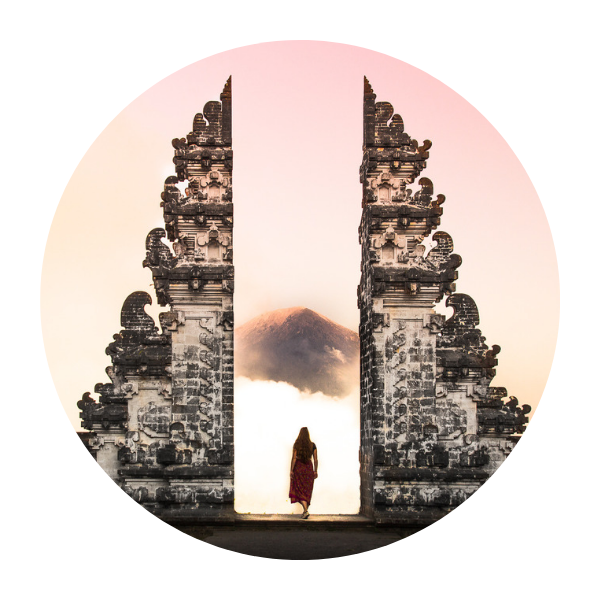 Learn to cook the local Indonesian cuisine, go shopping or simply awe at Prambanan are just one of the few things to do in Yogyakarta. But the city itself is just a small part of Yogyakarta’s beauty. Rent a scooter or book a tour and explore Mount Merapi, an active volcano just outside of the city. Yogyakarta is a city that could easily keep you busy for days, and definitely should be on your list of places to see in Southeast Asia! Bali has many beautiful temples but none of them are as unique as the Tirta Empul Temple, or Pura Tirta Empul. Pura Tirta Empul is a water temple located near the town of Ubud in Bali. The temple is a Hindu Balinese Temple and is considered to be one of the most holy temples in Bali. 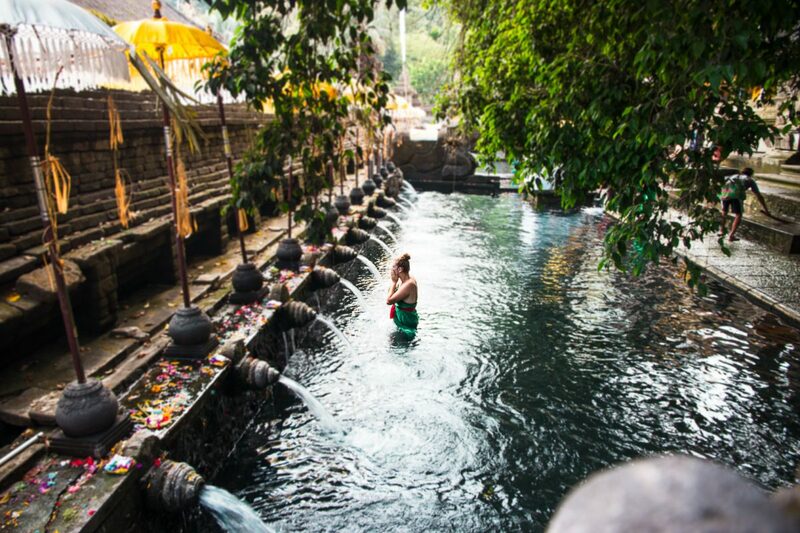 People from all over the island come to the Tirta Empul Temple to do the purification ritual, and the best news, you can do it to, just be sure to be respectful of the customs of the ritual and to follow the steps as closely as you can to show respect. Interested in joining the purification ritual? Read here everything you need to know about visiting the Pura Tirta Empul temple in Bali! 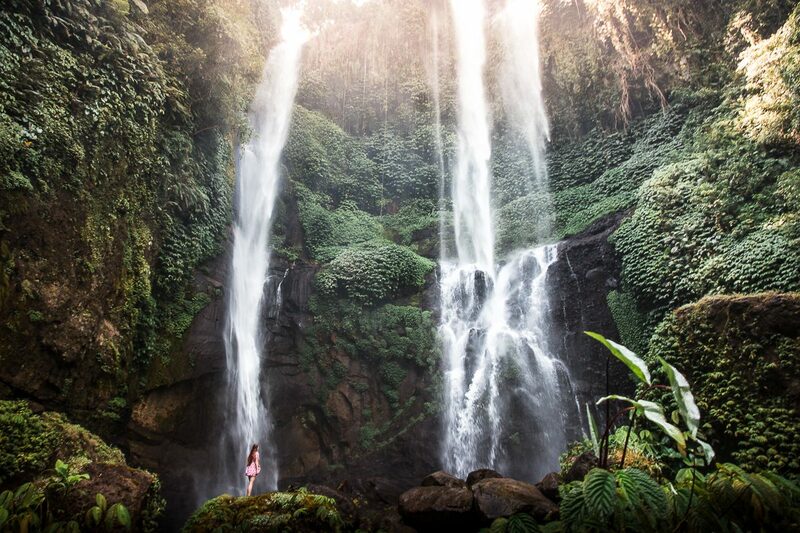 If there is one thing Bali is known for it must be the magical waterfalls. From waterfalls hidden in caves, to smaller waterfalls with little pools at the bottom for swimming, there are so many waterfalls that trying to see all of the waterfalls can be a vacation on its own! Near Ubud, Bali’s cultural capital, you can find the Tibumana Waterfall and the magical Tukad Cepung Waterfall. But no whatever in Bali is as beautiful as the mighty Sekumpul Waterfall. Looking to go a bit more off the beaten path and explore the unexplored waterfalls? Be sure to make a stop at the Banyu Wana Amertha Waterfall and the Banyumala Twin Waterfalls. Both waterfalls are located in the North of Bali, an area explored by only a few tourist and travelers. 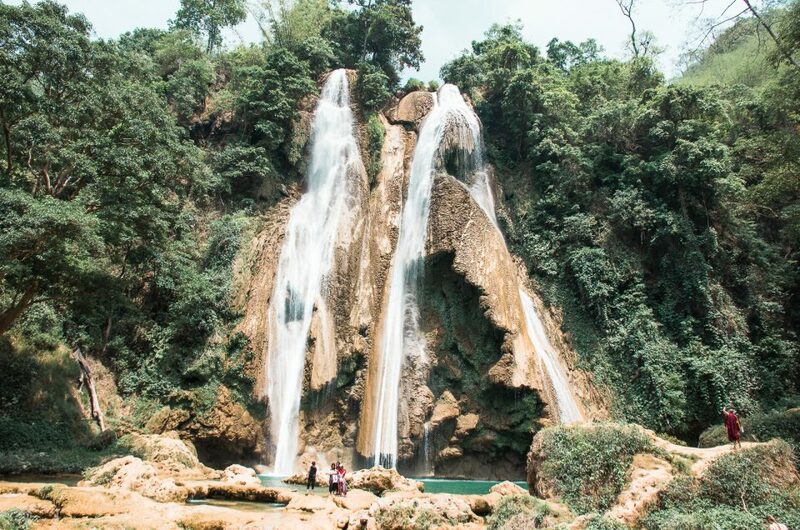 If you are an adventure lover, chasing waterfalls is a must to have on your Southeast Asia Bucket List. Komodo National Park in Indonesia is a stunning place to explore, both above and below water. You can wander amongst real life (Komodo) dragons, marvel at stunning sunsets and scuba dive along some of the most beautiful coral reefs in the World. Komodo is made up of so many pristine islands you can spend weeks island-hopping around the picturesque Komodo National Park. One of the most famous islands to start your exploration is either Rinca or Komodo where you can spot the famous Komodo Dragons. They’ll likely be basking in the midday sun or scampering around the shady forest, just don’t get too close as these enormous deadly reptiles pack a venomous bite and can easily outrun you! Hike up any of the stunning islands of Komodo for epic views of the volcanic islands and sparkling turquoise waters. One of the most famous viewpoints in Indonesia is on Padar Island, within Komodo National Park, and is breath-taking. For one of the best sunsets you’ll ever witness take the relatively easy hike up Gili Lawa Darat and don’t forget a cold beer! Under the water even more adventures await. You can spot sharks, graceful manta rays, adorable turtles and miles of colorful corals. Although the scuba diving out here isn’t the easiest, you can have a blast with some of the exhilarating currents, especially on The Cauldron dive as you whizz past the fish gathering to feed in the currents. Read more from Laura on The Travelling Stomach or check her out on Instagram! We can never have to many sunrises right? In the end, often watching the sun rise or set is truly one of the most beautiful parts of the day. Seeing the sunrise at Borobudur is one of those unforgettable bucket list moments, a memory to treasure forever. Climb up the steps to the top of the temple with a small group of people to find a perfect location to admire the sun slowly coming up. After the sun rise wander around the large temple to admire the architecture and the many buddhas to be found in the stupas and on the facades of the temple. 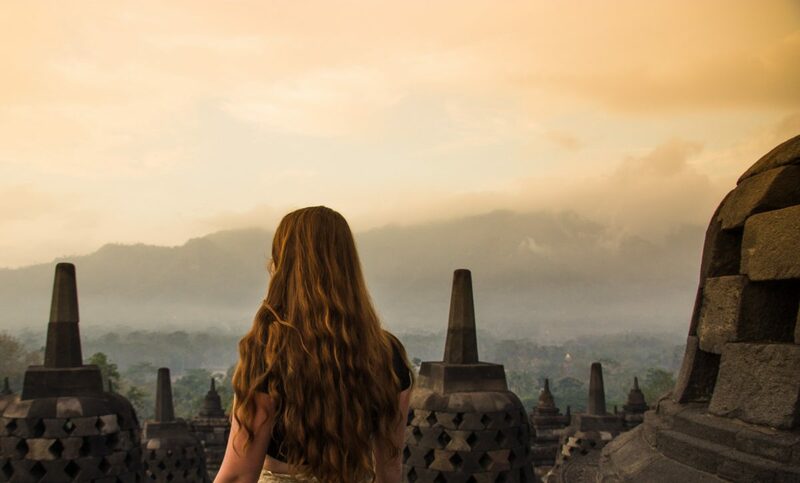 Interested in adding Borobudur to your Indonesia Bucket List? Be sure to read our full guide with all info on seeing the sun rise at Borodudur! 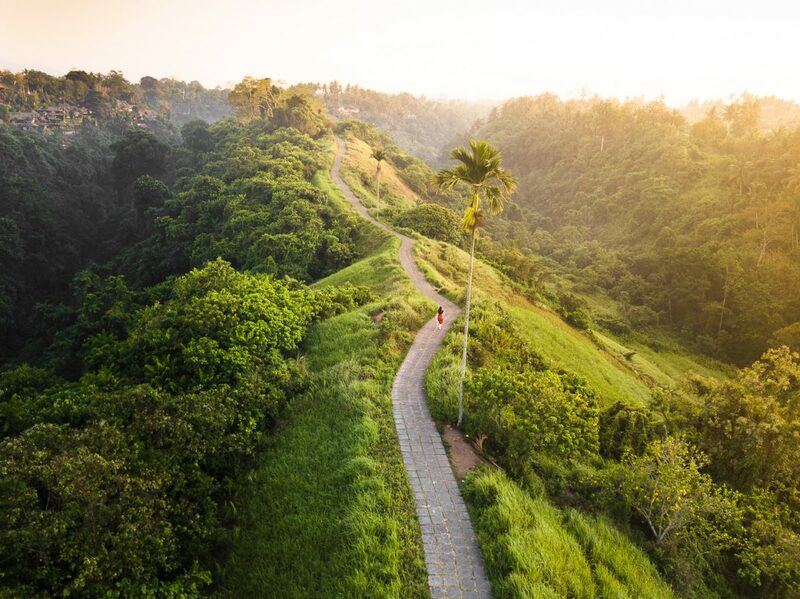 A short but hidden walk at the edge of Ubud’s centre, the Campuhan Ridge Walk is a must do when visiting Bali! Walk along palm trees and rice fields and escape from the hustle and bustle from the busy Ubud streets. The best time to visit the Campuhan Ridge Walk is very early in the morning, you won’t only get to see a stunning sunrise, you will also be lucky enough to have the whole walk almost completely to yourself. If you are planning on visiting Bali, be sure to check out our guide for first time Bali visitors with things you should know before you go! If there is one place in Indonesia that you must have seen tens, if not hundreds of times on Instagram, it must be the Tegalalang Rice Terraces. The Tegalalang Rice Terraces are located near Ubud in Bali, and while this place is photographed so many times, it doesn’t do it’s beauty in real life any justice. The Tegalalang Rice terraces are a large complex of rice terraces stretched out, right along the road. You can easily enter the terraces and wander around going up and down the fields to find the most beautiful place for a photo or you can simply enjoy the view from one of the many cafes up top. Check out all our tips for visiting the Tegalalang Rice Terraces in our full guide! Planning on traveling to Bali? 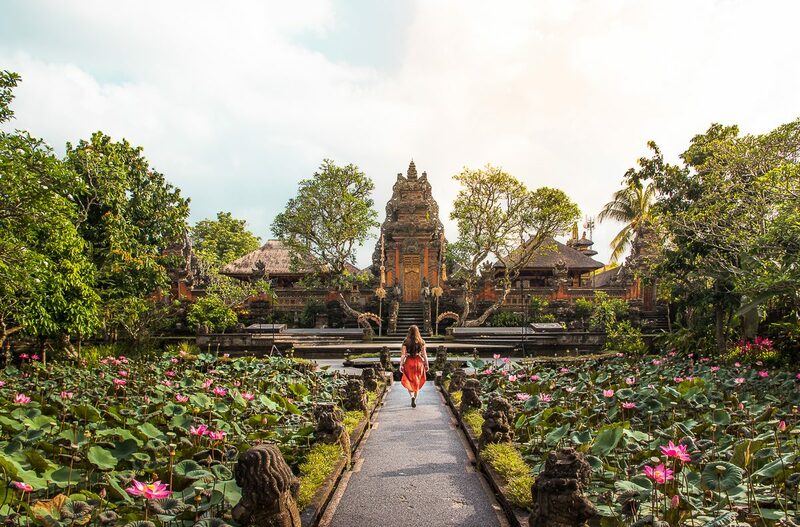 There is one place that should be on your Bali Bucket List and that is Ubud. 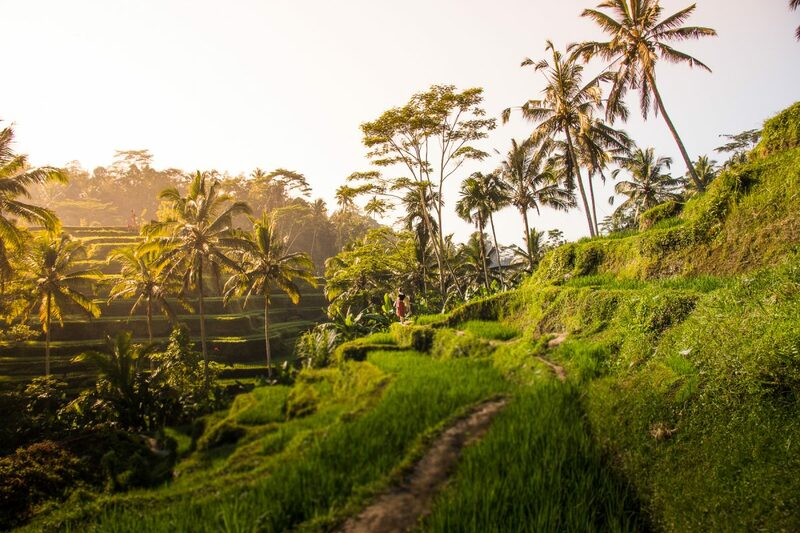 Ubud is Bali’s cultural capital, and the place to be if you want to see some of Bali’s most beautiful temples, rice fields and waterfalls. Go shopping at the Ubud Art Market or simply stroll through the small streets of Ubud looking for the most delicious vegan and non vegan eats. While Ubud is only small there are so many things to do in Ubud it could easily keep you busy for days! One of those cities that you don’t want to leave off your Southeast Asia Bucket List for sure. 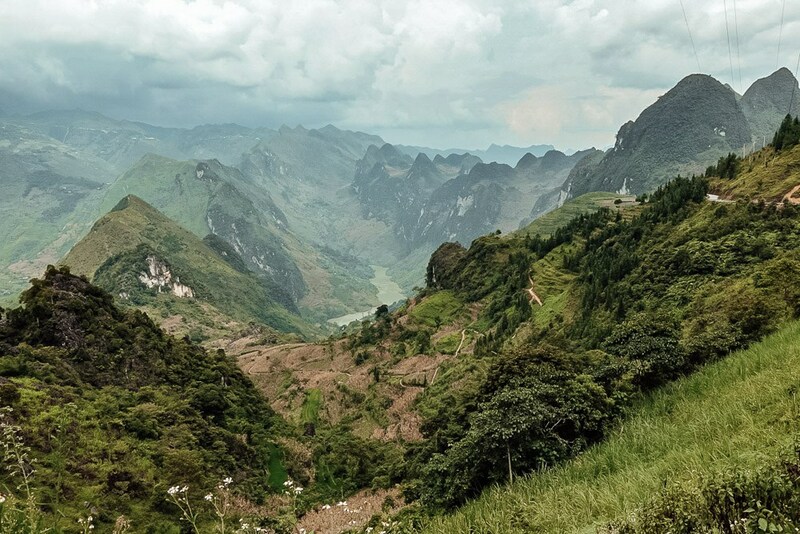 The Ha Giang region (pronounced Ah-Ziang) of Vietnam is considered by many to be the most beautiful place in the country… but it’s only the off-the-beaten-path travelers that make it there. It certainly deserves a spot on the Ultimate Southeast Asia Bucket List for its outstanding beauty! 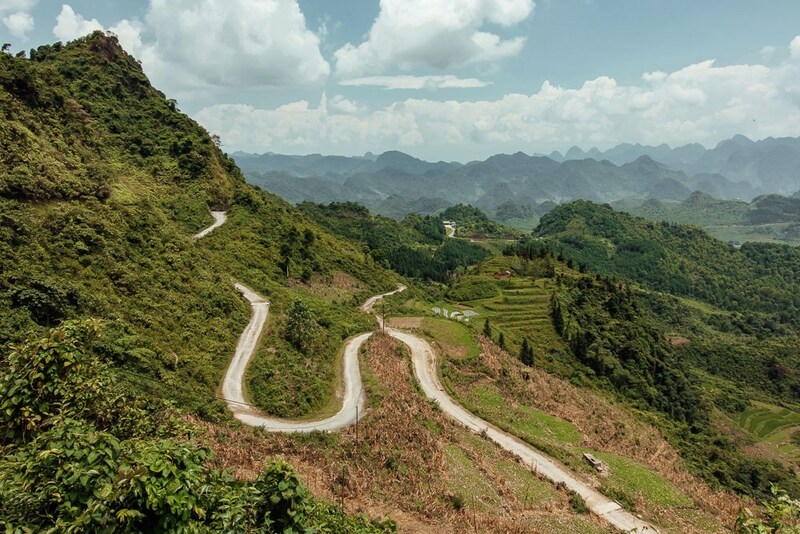 The Ha Giang Northern Loop is characterized by massive karst formations over 500 million years old and is a UNESCO World Heritage Site in and of itself! Most people, when visiting Northern Vietnam, opt to visit Sapa, which is a more easily accessible, commercialized area. Sapa is absolutely lovely (I went there as well), but it’s worth the effort to go a bit farther and reach Vietnam’s most remote region. The karst formations around every bend will leave you breathless as you journey deeper into the region! Read more from Sarah on The Five Foot Traveler or check her out on Instagram! Visiting Vietnam means you will most likely pay a visit to the country’s capital, Hanoi. Hanoi is a large bustling city located in the North of Vietnam, and is the ultimate homebase for exploring places such as Ha Long Bay and Sa Pa. However, the city itself definitely deserves some of your time to be explored. Wander around the maze of streets in the Old Quarter along the small shops and the many local restaurants with small chairs. Make your way to the Hoan Kiem Lake and train street for some picture worthy places or simply find a cafe to drink some coffee and watch the world go by, there is something for everyone in Hanoi. 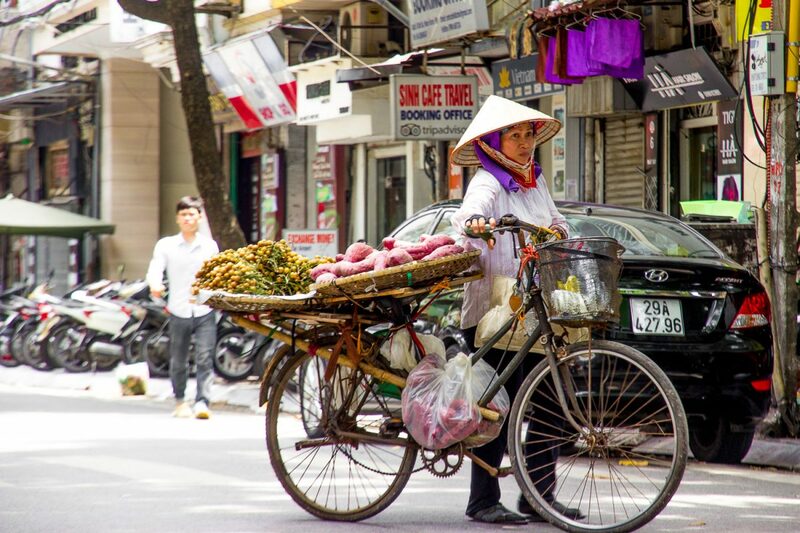 Not sure where to begin, check out our full guide to Hanoi right here! When we think of Vietnam, we might think of motorbikes weaving through the crazy traffic, rice fields or the nón lá (conical straw hats). What probably doesn’t spring to mind is palaces, grand dynasties or powerful emperors. The city of Hue is the former capital of Vietnam, and visiting will add a little bit of royalty to your trip. Here you can visit the Imperial City (filled with grand architecture and anything an emperor could want!) and tombs where the emperors were buried. The most magnificent tombs include the Tomb of Khai Dinh, the Tomb of Tu Duc (who’s tomb involved so much labor and extra taxation that there was an attempted coup!) and the Tomb of Minh Mang. Even for travelers who aren’t as interested in history, Hue is a beautiful and peaceful place and worth an addition to your Vietnam trip. 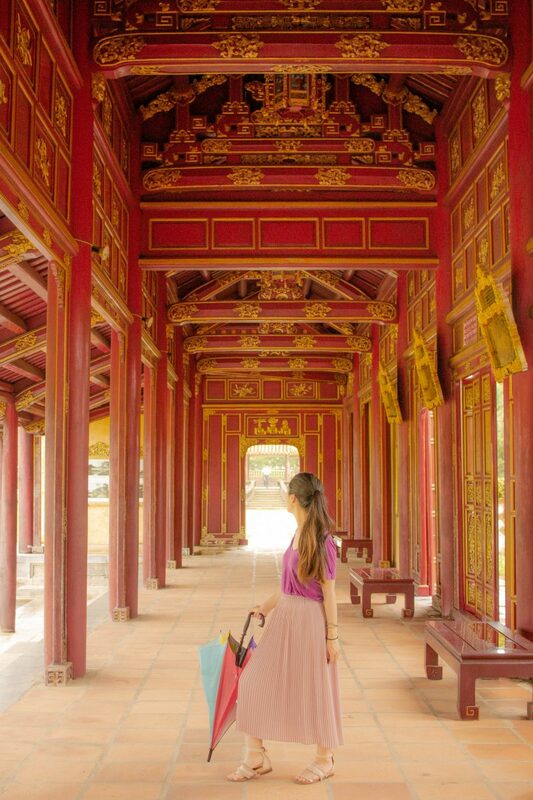 Read more from MG about visiting the tombs of Hue on The Wandering Suitcase or check her out on Facebook! Yes, this might sound a bit insane first, especially if you know what Vietnamese traffic is like. But riding a motorbike in Vietnam means ultimate freedom to explore the most amazing sights. 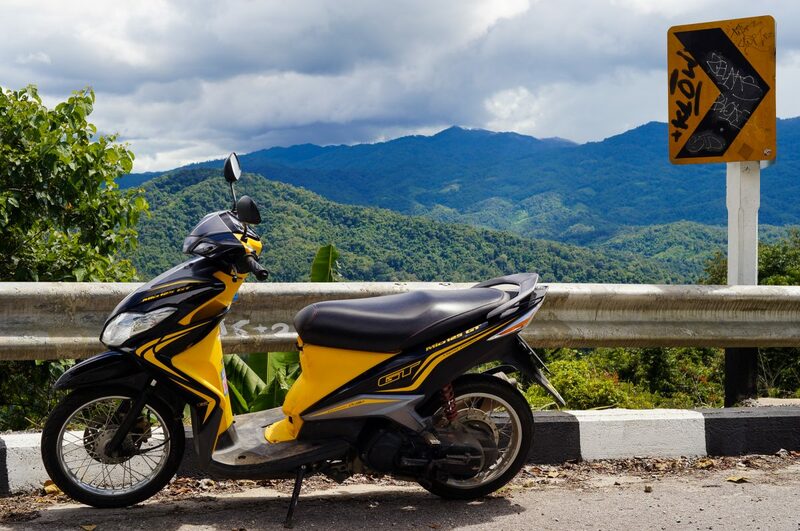 Simply buy or rent a motorbike or scooter and head to the undiscovered North or ride the classic trail from North to South, with a motorbike anything is possible. Besides that, buying a motorbike (Honda Win) can be as cheap as 200$US. Riding a motorbike in Vietnam is a true adventure, but does come with some risks and needed expertise. Still interested? Read all tips and information about riding a motorbike in Vietnam here! Mui Ne is a beach resort town just a few hours east of Ho Chi Minh City in Vietnam. The best part about Mui Ne is the incredible natural landscape uniquely to the region. The White Sand Dunes is the larger of the sand dunes where you can hire an ATV or jeep to take you around. It is a quite thrilling ride up the hills. At the top, you can see miles and miles of sand and the lakes nearby. And it is an excellent spot for sandboarding! On the way back to Mui Ne, visit the Red Sand Dunes which the smaller of the two but still pretty impressive. The bright orange-red colour creates a gorgeous backdrop for Instagram photos! Visiting the dunes is very easy. 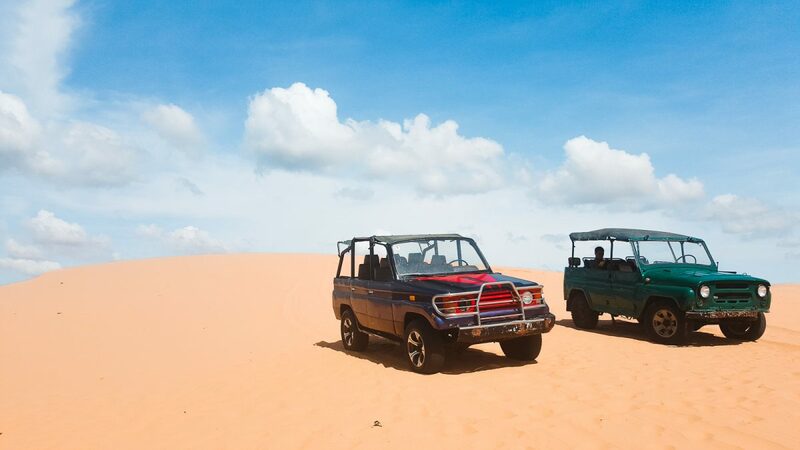 You can either visit the sand dunes with a tour operator or hire a taxi on your own. Read more from Queenie about exploring the sand dunes of Mui Ne on Ms Travel Solo or check out her Pinterest! In the North of Vietnam you can find the small town of Sa Pa. And while the town itself is not really that special, the surroundings of Sa Pa sure are! From Sa Pa town centre you can easily arrange a multiple day trekking to witness some of the most beautiful views of Vietnam. Walk along the rice fields with a local guide and stay at a local family’s homestay to have a true feeling of what living in Sa Pa is like. The rice fields seem to be endless and stretching out through valleys and mountain sides, Sa Pa is one of those places that definitely should be on your Southeast Asia travel route! Considered by some as the Halong Bay on land; Ninh Binh is an incredible sight to see. So beautiful in fact that the movie Kong: Skull Island was filmed there in 2016. Most of the accommodation is set on the lakeside close to the many attractions. The best way to get around is to rent a scooter to visit the different areas. It is possible to take boat rides in both Tam Coc and Trang An. It is incredible to see the boatman/woman use their feet to row the boats along the river. 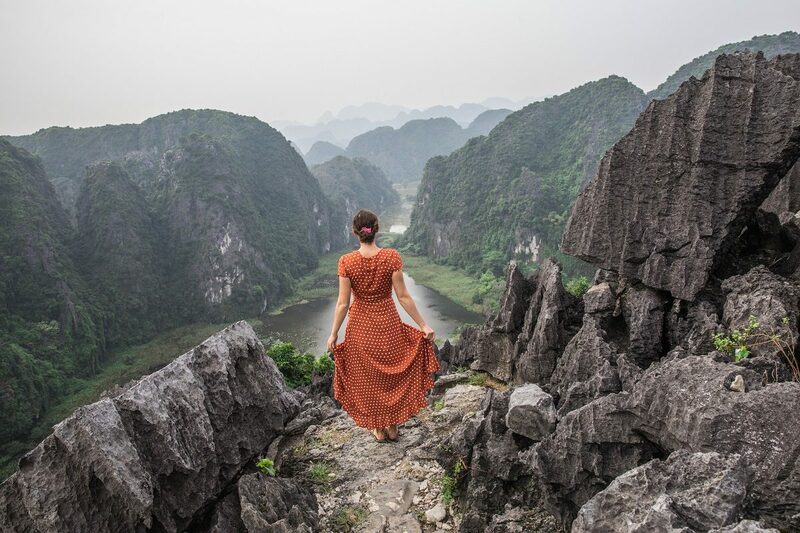 One of the most beautiful sights in Vietnam is the hike at the Mua Caves. This overlooks the amazing rock formations in the area and is an incredible place for photo opportunities. The hike takes about 20 minutes and is worth the effort. Located only two hours from Hanoi, Ninh Binh is the perfect place to get away from the busy city life and get some relaxation. Read more from Yana on Beard and Curly or check her out on Instagram! A former French hill station, Dalat was chosen as the site of a colonial outpost because of its year-round temperate weather. Located just 300km northeast of Saigon, it’s a great place to escape Ho Chi Minh City’s sweltering heat. The town of Dalat itself is very picturesque, with plenty of heritage architecture, old villas and historic churches. But the best things to do in Dalat lie outside the city limits in the surrounding hills and valleys. Hire a motorbike or organise an easy rider tour to take you along Lam Dong Province’s winding roads. On the way, you can visit coffee plantations, hilltop monasteries, waterfalls and flower farms. Back in town, sample local coffee, wine and fruit at one of Dalat’s many street food markets or hip cafes. 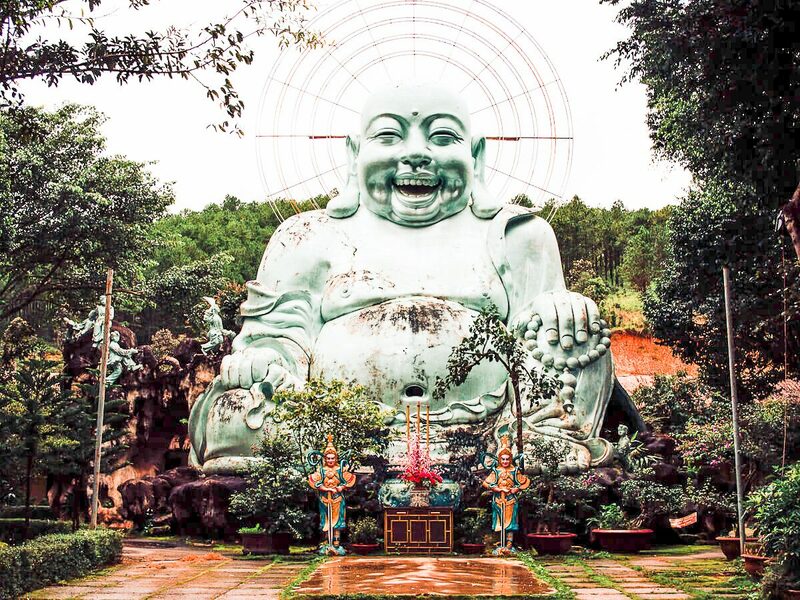 Read more from Emily about the best things to do in Dalat on Wander-Lush or check her out on Instagram! Hoi An is the kind of place you plan on staying a few days and end up staying two weeks. 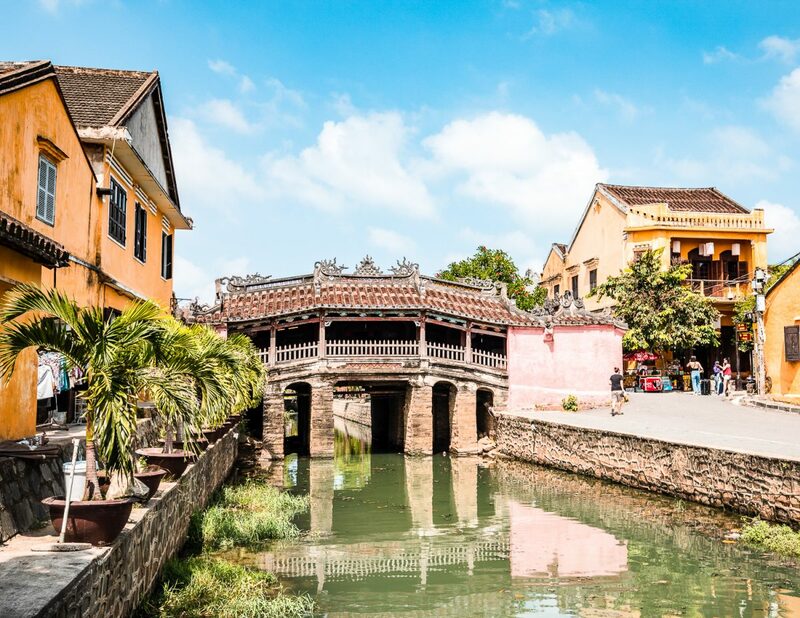 This beautiful ancient trading port in the centre of Vietnam has been enchanting visitors for centuries with its yellow walls, terracotta roofs and lantern lined streets. The town comes alive at night as the river is full of floating lanterns which reach a crescendo at the monthly festival during a full moon. The streets are also lit by lanterns, giving the whole place a beautiful atmosphere. You can choose to visit the night market or even get yourself a tailor-made suit or dress at a fraction of the price you’d pay anywhere else in the world for the same quality (something Hoi An is famous for). When you tire of coffee shop hopping you can grab a bicycle and cycle along the rice terraces or to the beach. Hoi An is a place that’s easy to fall in love with. Read more from Cat on Walk My World or check her out Instagram! 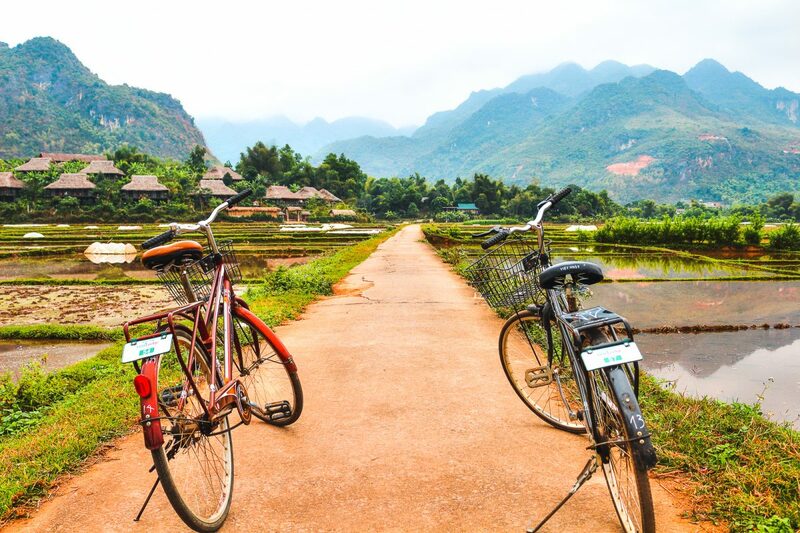 Four hours from Hanoi, the capital of Vietnam, there is the scenic valley of Mai Chau which provides the perfect rural escape from the capital’s traffic mayhem and noise. Surrounded by towering cliffs, you can cycle or walk through trails lined with verdant rice fields and vegetation. Home to the Tai Dam and Tai Kao minority groups, pay a visit to ethnic villages preserved in time with their stilt houses and handwoven brocade attires. To get here, catch a bus at the My Dinh Bus Station in Hanoi. 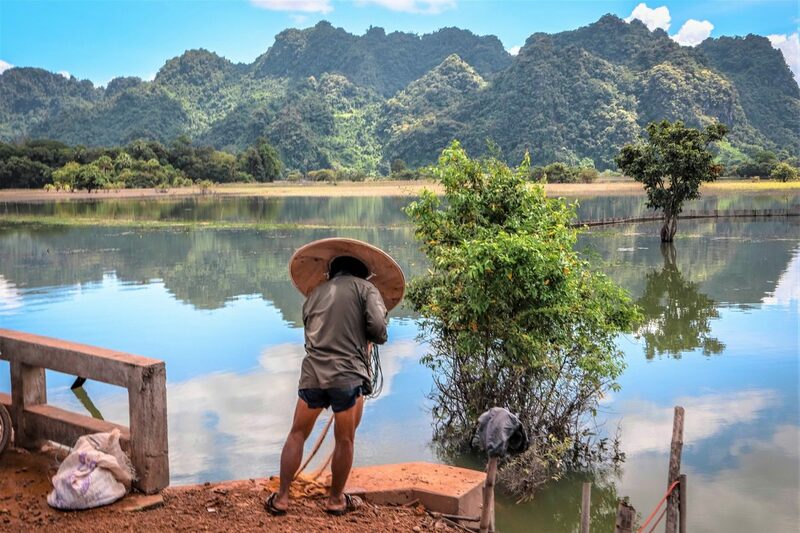 The four-hour bus ride includes a stopover at Thung Khe Pass where you will find some food shacks and a stunning view of white cliffs and the valley below. Read more from Karolina on Lazy Travel Blog or check her out on Facebook! Myanmar, the country of smiles, a country that had closed borders until earlier this century it opened its borders and welcomed all travelers and tourists to admire the beauty of this country. A country that is filled with stunning temples, unexplored beaches and some of the most kind people we had met during our travels of Southeast Asia. Myanmar is a country that is slowly becoming more and more part of people’s Southeast Asia itinerary, and as such it deserves a section on this Southeast Asia bucket list. Read here everything you need to add to your Myanmar Bucket List! Venture out of Yangon’s China Town and explore the undiscovered areas of Yangon by riding the circle train. The circle train, as the name says, makes it way by going a full circle through Yangon’s neighborhoods, starting from the central station. Jump off the train at the different platforms and walk around the area to see more of Yangon’s daily life. Eat some of the local food and hop back on the train to go to your next destination. The circle train can easily keep you busy for a full day, so be sure to take one of the earlier trains! 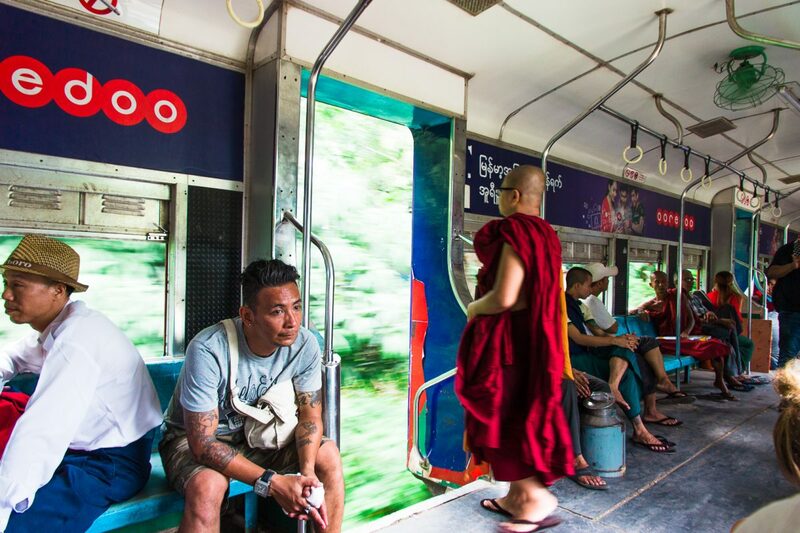 Read about the circle train, and many other things to do in Yangon right here! Okay, sunrises are just as spectacular. But for the not so early birds, watching a sunset can be just as magical. Myanmar opened its borders earlier this decade and tourism has been on the rise since. In 2015 it was still possible to escape the crowds in Myanmar, now Myanmar has become a common country in the Southeast Asian backpacking route, a country you don’t want to miss out on! Many head to former Burma for one reason, the magical temple fields of Bagan. A must see when you are in Southeast Asia, you will not be disappointed. Admire the many temples while the sun colors the sky from blue to a golden yellow and orange. And if you are lucky and visiting in the right season there is even the option to go on a small journey in a hot air balloon to admire the temples from up above! This off the beaten path destination in Myanmar is one of the most beautiful places in the entire Southeast Asia. Hpa An is great if you are looking for a combination of breathtaking views, adventure and culture. With tall limestone mountains, endless rice fields and incredible temples, Hpa An should definitely be on your bucket list. Take a one day tuk tuk tour and explore all the nearby caves which are home to thousands of Buddha statues. Don’t forget to also see the local fishermen and visit the Kyauk Kalat Pagoda. If you’re feeling adventurous, head for a hike on Mount Zwekabin. You will be rewarded with the most incredible views over the entire Hpa An area. 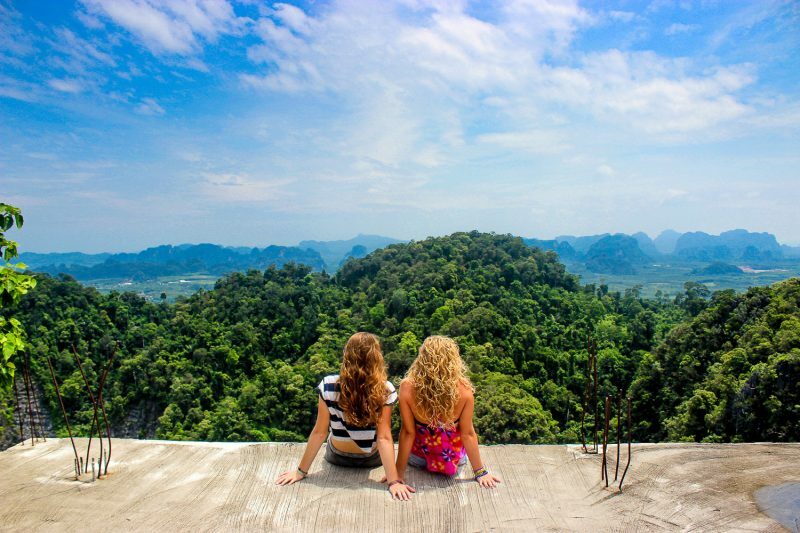 Read more from Aura about Exploring Hpa An on Daily Travel Pill or check her out on Instagram! A pagoda like you have never seen before, completely white, and simply magical. While not located exactly in Mandalay, it can easily be visited on a half day trip when staying in Mandalay. Climb the steps of the stunning structure to make your way all the way to the top of the Pagoda. It truly is an architectural masterpiece, and definitely something that should be on your Myanmar bucket list! However, this is not the only thing there is to do in Mandalay, check out all our recommendation for Mandalay here. 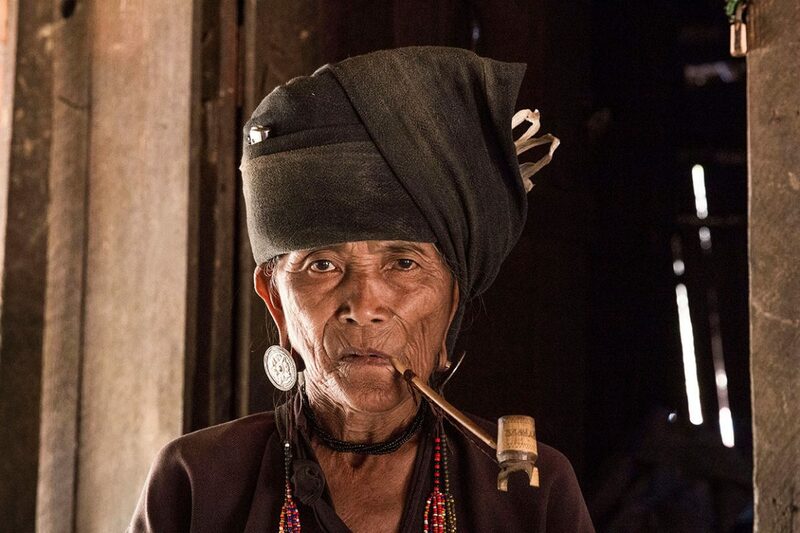 Not many tourists have heard about Kyaing Tong, Myanmar but this is a must-see item for your Southeast Asia bucket list if you are interested in learning about the local hill tribes of Myanmar. Kyaing Tong is located in the Shan State of Myanmar and the main reason people visit this area is to meet the local hill tribes that still hold on to their old traditions. During our visit, we hiked through several villages around the area and visited the homes of the local women. With the help of a local guide we learned about the customs of the Akho women and their long pipes or the Ann women who paint their teeth black and many more. It was a unique experience, especially since most of the time, we were the only tourists in the area. It is one of Myanmar’s hidden gems for anyone who loves culture and unique experiences. Read more from Maya and Sari about visiting the Hill Tribes of Kyaing Tong on Chasing Lenscapes or check out their Instagram! Who can ever get enough of the Southeast Asian sun sets? Stunning viewpoints, hills, temples, there are so many to witness, but some are more memorable then the others. Make you way up to Mandalay to see the sun setting over the city, but it isn’t the sun set that makes it memorable here, it is the location. On top of Mandalay Hill you can find the temple from where you can view the sunset, but the whole temple seems to be covered in small pieces of colored almost mirror like mosaic, and when the sun sets the golden sun rays turn the temple into a golden kaleidoscope, just one of the few things things to do in Mandalay that should be on your Southeast Asia bucket list! 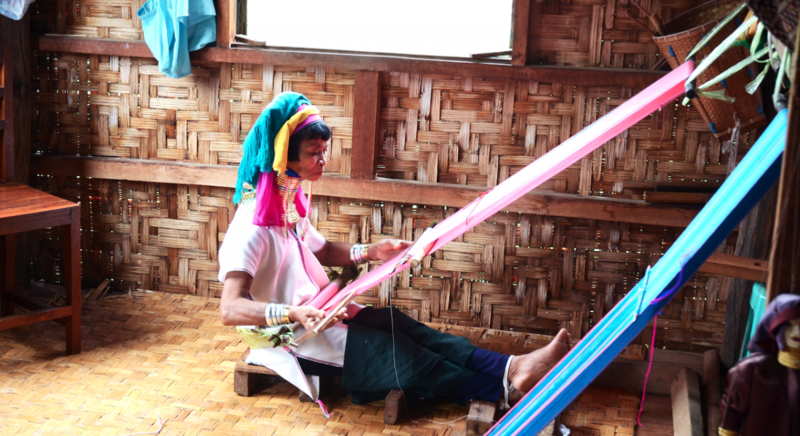 The women of the Kayan Lahwi tribe, native to Eastern Myanmar, have been a legendary curiosity for centuries. 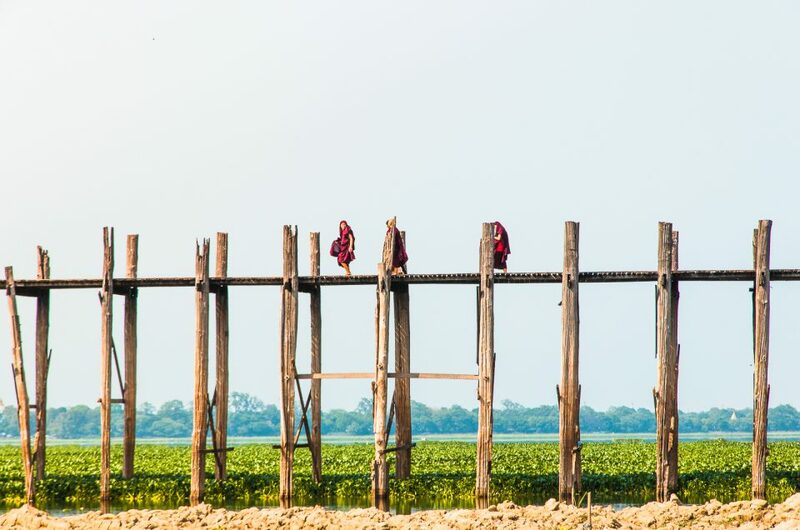 Known for an ancient tradition practised by the favourite daughter in each family, the elongated necks of the Kayan women are a site you can’t miss when you’re travelling in South East Asia. The brass neck coils used to stretch their necks were initially designed to protect the girls from tiger attacks, and to make the women resemble dragons. In the Kan Khwan religion, practised by the tribe, the Kayan people are thought to have been born from a dragon, and in mutating their bodies the women pay homage to this mother dragon. These days fewer and fewer young women choose to wear the rings, but you can still meet many older ‘giraffe women’ in Myanmar. Read more from Sara-Jane on Listen To The Wild ! A pagoda so large it dominates the Yangon Skyline. The pagoda can easily be spotted from hundreds of meters away, and if you are lucky, you can witness it from your flight into or out of the country. Admire the world at the pagoda go by just by simply taking a seat on the floor and see everyone pass by. It is almost nearly impossible to have the place to yourself, even early in the mornings, as it is just simply always busy. Admire the monks and local people praying at the many shrines available and have a walk around the pagodas stupa, as every angle will give you a new and surprising view. 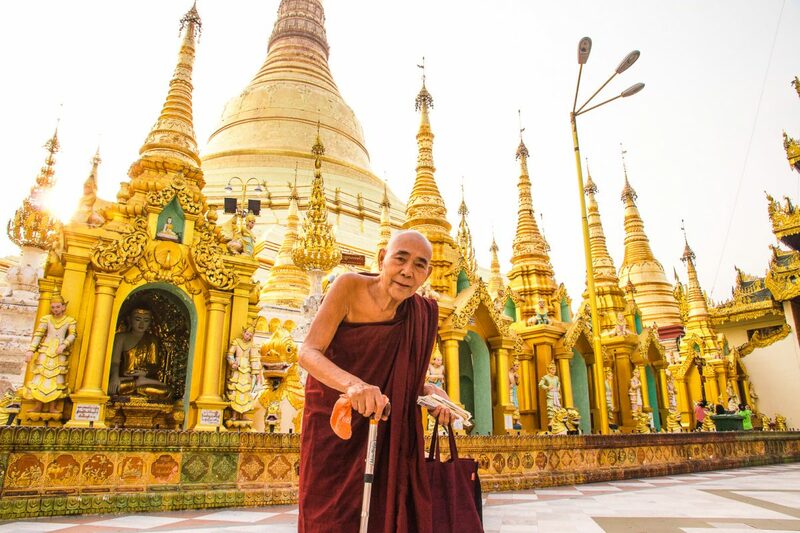 The Shwedagon Pagoda is truly stunning so don’t forget to add this, and the many other things to do in Yangon, to your Southeast Asia Bucket List! 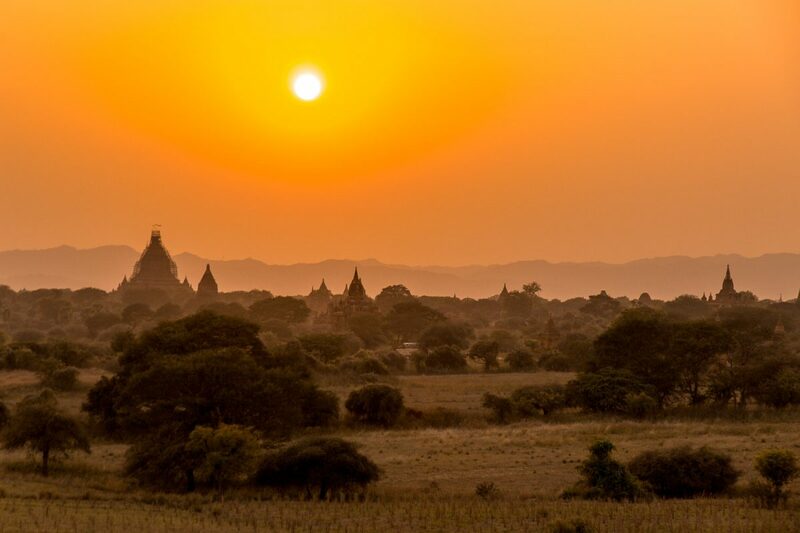 Myanmar is the perfect place to go off the beaten path. Many places are still undiscovered or low in tourism. Trekking is becoming popular in more and more places, and one of the most popular trekkings in Myanmar must be the Kalaw to Inle Lake trekking, which can easily be done with the help of a local guide. Sleeping in rural villages while walking over hills of green scenery, hiring a local guide is such a great Myanmar travel tip, you will experience the country from a whole new perspective. Another popular destination for going trekking in Myanmar is Hsipaw. 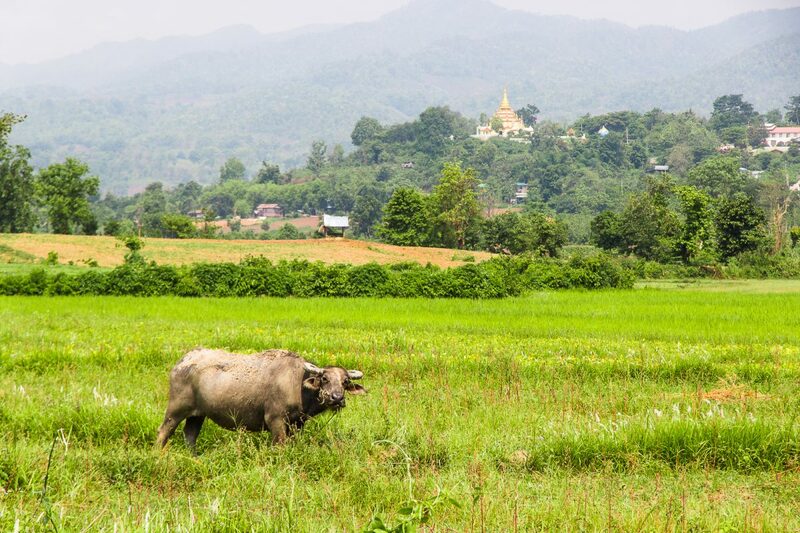 Hsipaw is located in Myanmar’s Shan State and has some of the most beautiful hikes of the country. 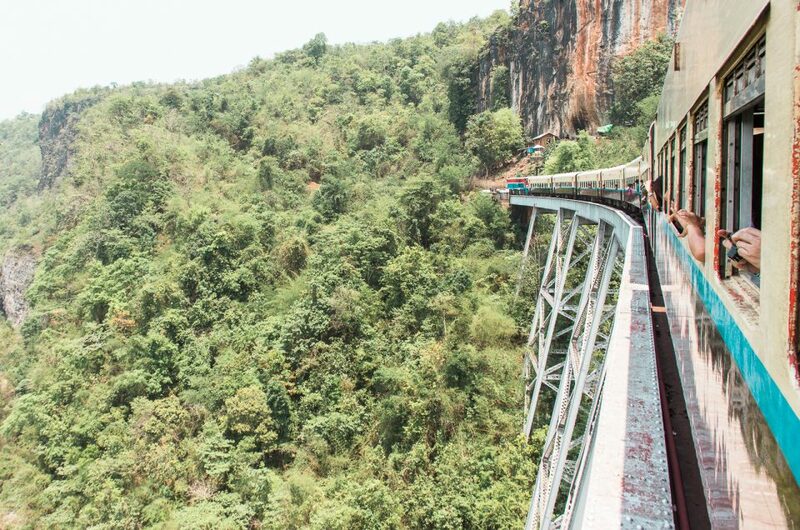 To reach Hsipaw be sure to take the local train that crosses the Goteik Viaduct, it is the most beautiful train ride of the whole country! The Kek Lok Si Temple in Penang is easily the most underrated bucket list item of Malaysia. While many visit the streets of Georgetown, Penang to admire the street art and taste the delicious food, only a few make it to the Kek Lok Si Temple. Even though the temple is situated outside of the ‘touristic’ centre of Georgetown, it is well worth the effort to make your way there, as there aren’t many temples in Asia that are as impressive as the Kek Lok Si Temple. 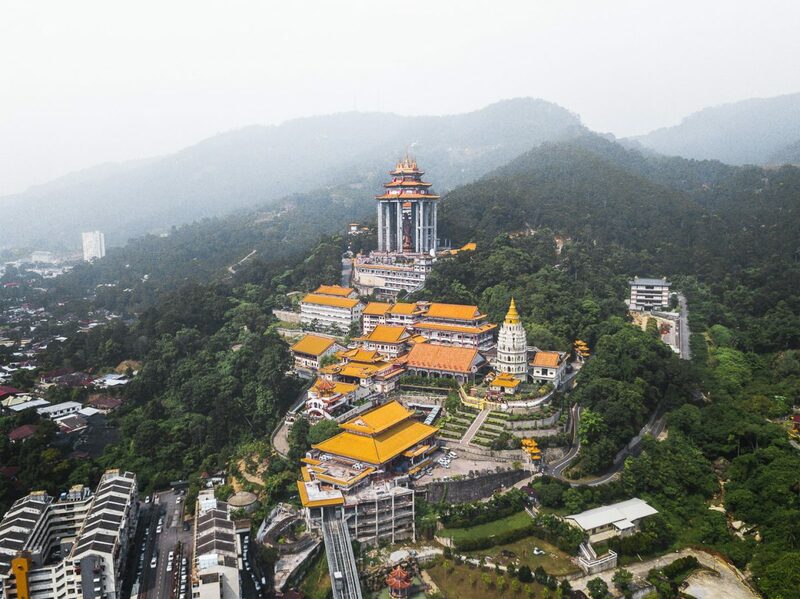 You can easily get lost in the temple for hours, and when you finally make it to the top, you will be rewarded with one of the most beautiful views over Penang. Intrigued to add the Kek Lok Si Temple to your Malaysia and Southeast Asia Bucket List? Read here our full post with everything you need to know about visiting the Kek Lok Si temple! Not as famous as Penang, but Ipoh’s street art is certainly up and coming on the Malaysia Bucket List. The same artist who decorated the streets of Penang with his pieces of art did the same in Ipoh a couple years later. The good part… it is fairly undiscovered yet. Tourism still has to rise in Ipoh meaning you can wander around the quiet streets enjoying Ipoh’s street art without having to stand in line to take a photo, and if that isn’t enough to go, be sure to taste the delicious and iconic Malaysian white coffee, that originates from the small town of Ipoh. The Batu Caves, a must see when visiting the vibrant city of Kuala Lumpur, but be sure to be careful of the monkeys. The Batu Caves are a place of Hindu Worship and attract many visitors on a daily basis, not only for religious purposes, but also simply to admire the masterpiece of architecture. To top it, the Batu Caves have undergone a recent renovation in late 2018 and the steps are now painted in all the colors of the rainbow, making it one of the most instagrammable and colorful places of Malaysia. If you are up for it, climb the steps all the way to the top to admire the temple hidden in the cave. Interested in visiting? 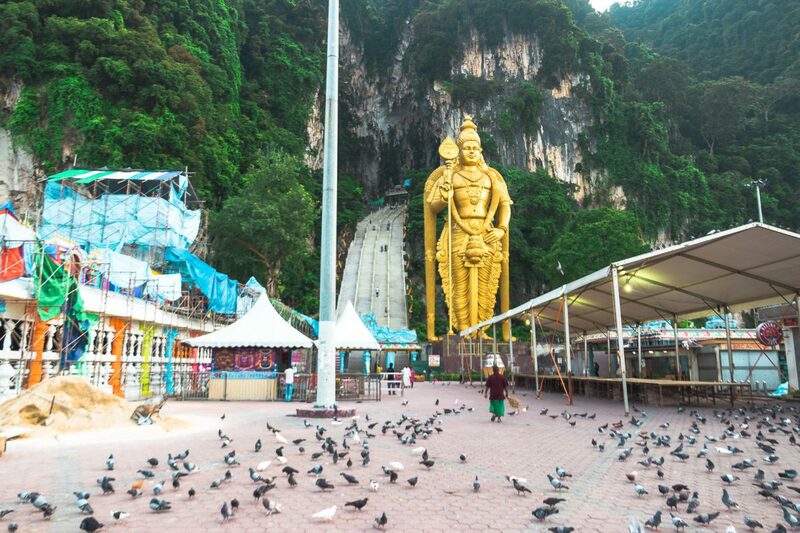 Be sure to check our full guide with all tips and tricks to visiting the Batu Caves! Not far from the hidden gem Malaysian town of Ipoh in the state of Perak, is the smaller town of Gopeng. Gopeng is unassuming, as is typical of Perak state in general, and most small towns of Malaysia. But the open secret? It is the best adventure destination of the west coast! In this part of Perak, you can explore the caves of Gua Tempurung, bathe under waterfalls, go tubing downriver – even go to mountaineering school! But the bucket list activity has to be whitewater rafting down the rapids of Kampar River. Exciting and a heck of a lot of fun, the local adventure providers are also professional, experienced, and take safety very seriously – a rare combination in Asia! Go with a few friends and try not to capsize! Read more from Teja about Whitewater Rafting on Teja on the Horizon or check her out on Facebook! One of the most beautiful places of Kuala Lumpur is hidden on a slight walk from Little India in Kuala Lumpur. 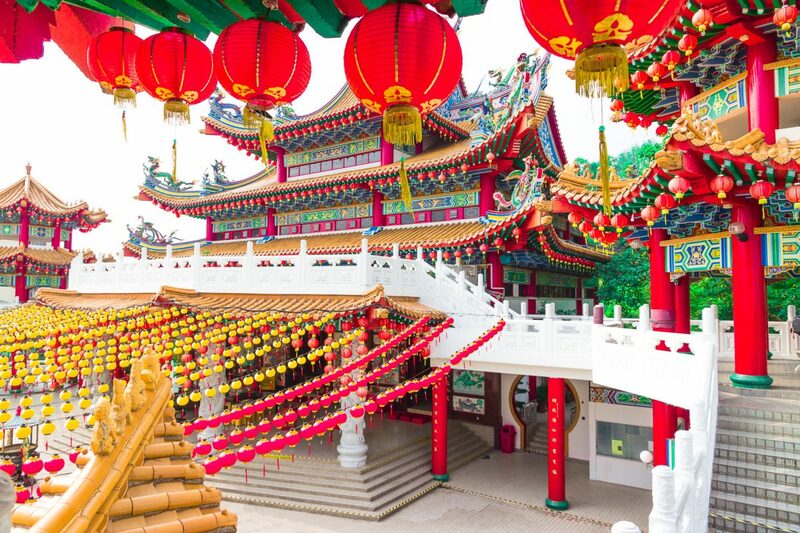 Decorated with stunning yellow or red lights and multiple levels of beautiful decorations, the Thean Hou Temple is a must have item on your Malaysia bucket list! The six tiered temple could keep you admiring the small details of the temple for simply hours, and on top of that, it is also an extremely photogenic place, from simply every angle. Go early to avoid the crowds and tours that stop by at this place, read about this and all our other tips in our Thean Hou Temple guide here. An easy and inexpensive bus ride from Kuala Lumpur (the journey takes around an hour and a half), Melaka is one of Malaysia’s most underrated cities. It’s quaint old town streets are a brilliant place to visit if you want to soak up some culture. Think period buildings full of Dutch and Chinese charm, quiet temples filled with the scent of incense, fusion heritage cuisine, and a buzzing night market. There’s also a hilarious and fun trishaw culture in Melaka, with trishaw drivers competing to attract tourists by decking out their rides in the most elaborate way possible. 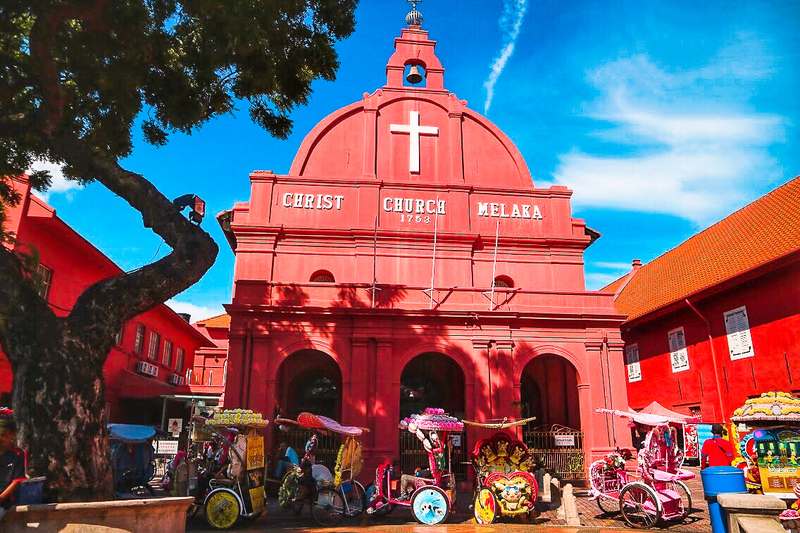 You can’t visit Melaka without going on an old town tour in a brightly-coloured trishaw covered in cartoon characters and flashing lights, blaring out pop tunes. Read more from Maire on Temples and Treehouses or check her out on Instagram! In the small city of George Town, Penang you will find some of the most amazing street art you have ever seen, it could keep you simply busy for hours to find all of the master pieces. 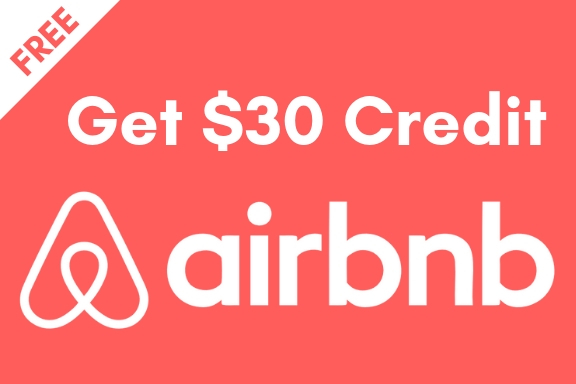 Ask for a map from your local hostel or hotel, and a fully charged camera or phone. As most of these masterpieces are interactive and a combination of both 2D and 3D, you sure want to document this. After having wandered the streets be sure to taste some of Penang’s delicious street foods, great activities for anyone who wants to travel Malaysia on a budget! The Mekong river cruise on a long tail boat is not just a very relaxing but definitely the most scenic way to start exploring Laos. The unmissable two-day trip starts at the small Thai-Lao border town of Huay-Xai and continues to Luang Prabang with an overnight stopover in the Pak Beng village. Each day you will spend up to six-seven hours on the boat enjoying the sun, a refreshing breeze and the gorgeous views on limestone mountains, lush vegetation and picturesque local villages. Pack some nice music or an interesting audiobook with you to listen to while absorbing the beauty around you. The cruise is becoming increasing popular, so make sure to arrive at the harbor well in advance to secure a comfortable seat at the front on the boat undisturbed by the roaring boat engine at the back. 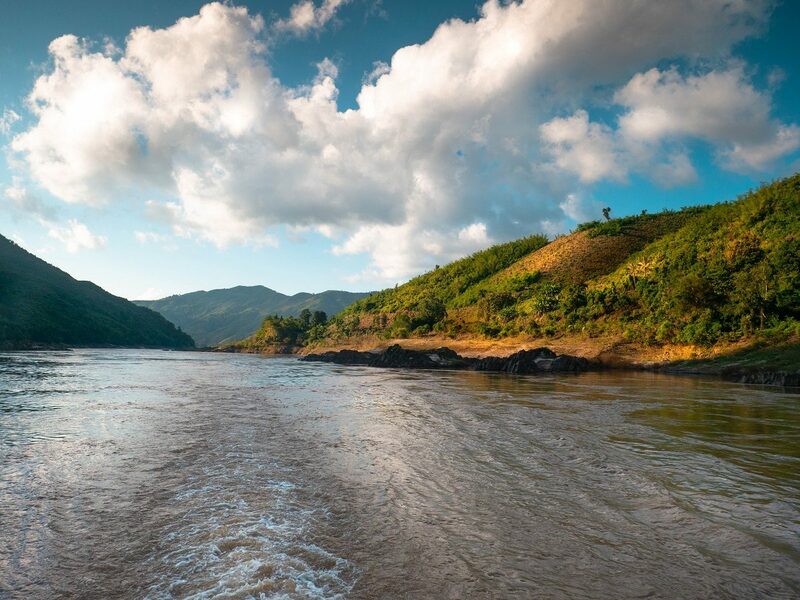 Read more from Darja about taking the Mekong River Cruise on DeeGees Life. In the North of Laos you can find the small town of Luang Prabang, a well known stop for backpackers. While there is not crazy much to do, the town has some worthy sights. 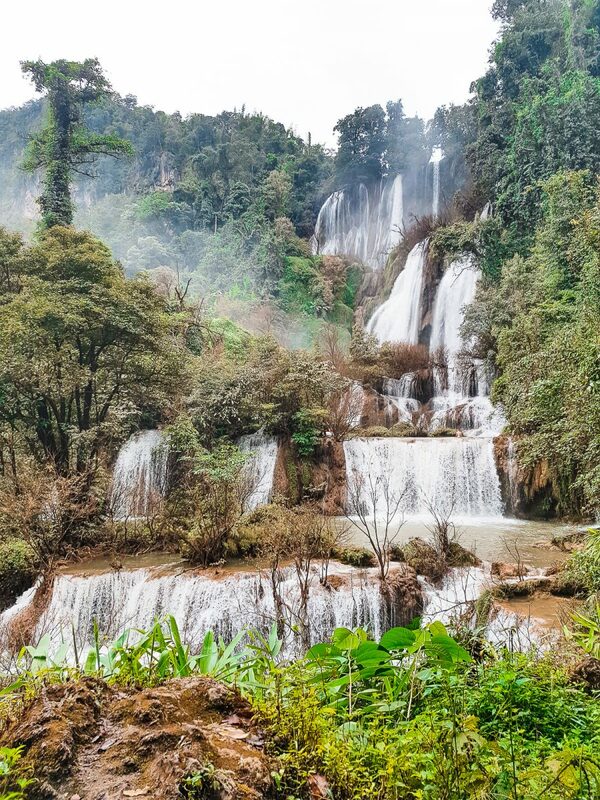 Climb the mountain to catch a sunset of the town or, most popular, witness the beauty of the Kuang Si Waterfall! And while you’re there, you might as well take a refreshing dip from the heat. If you don’t know what tubing is, it is basically just floating down a river in a big blown up inner tire. But why, you might wonder. Well because there are bars situated around the river. So all you basically do is sit in a tire and float from bar to bar to play beer pong, get free shots, play beach volleyball and drink a bit more. Due to the large increase of incidents the amount of bars has decreased, but it honestly is still a lot of fun. Muang Ngoi is a beautiful village in northern Laos. Perched on the banks of the remote Nam Ou river, Muang Ngoi is only reachable by a grueling 90 minute ride in a tiny local boat. The difficulty in getting to Muang Ngoi keeps many tourists away, and if you are willing to brave the journey you will be rewarded with a spectacular, crowd-free travel experience (a rare treat in popular Southeast Asia). Towering limestone cliffs surround Muang Ngoi, and the view from every corner of the village is stunning. Within hiking distance of Muang Ngoi you can access giant caves, picturesque swimming holes, and rural villages hardly touched by the modern world. Accommodation is rustic but comfortable, and expect to spend hours watching water buffalo and tropical birds from your porch hammock. Read more from Brittany about visiting Muang Ngoi on The Rolling Pack. Something you’ll likely do a lot in Southeast Asia is riding around on a scooter or motorbike. And while, it became one of my favorite things to do in Southeast Asia. It gives you ultimate freedom, is cheap, and an easy mode of transportation. It allows you to see so much in so little time. Located more in the South of Laos you can find the 3 to 4 day Thakhek loop. Drive over hills to caves, waterfalls and cold springs! A true adventure for the ones who are up for it. For more tips read my Laos Travel Guide! The former Royal Capital of Luang Prabang is particularly renowned as the cultural and spiritual heart of Laos. 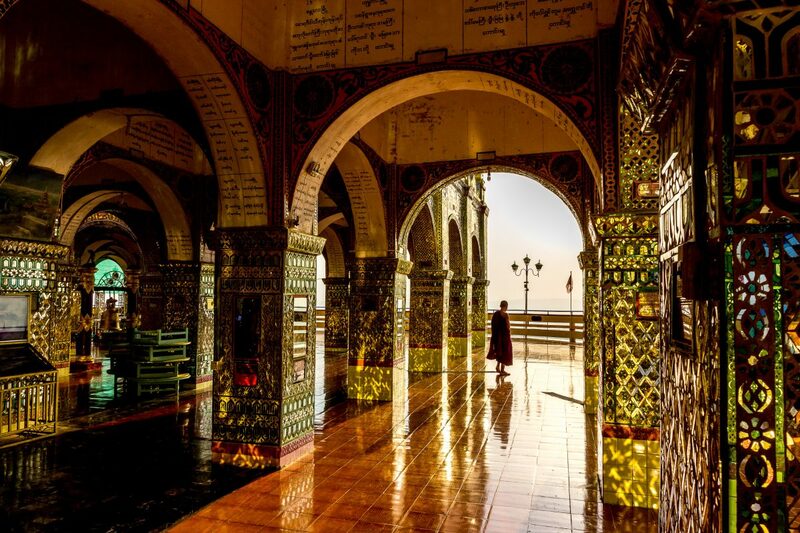 This picturesque town, situated at the convergence of the Nam Khan and Mekong Rivers, showcases historic French architecture, towering mountains, turquoise waterfalls and amazing cuisine. But it is undoubtedly, the 34 UNESCO-protected Buddhist temples, or wats, for which it is most famous. What makes Luang Prabang’s temples so different from others in Southeast Asia is that these aren’t simply museums or empty establishments, but rather homes to hundreds of monks and novices who continue to study and work within them. 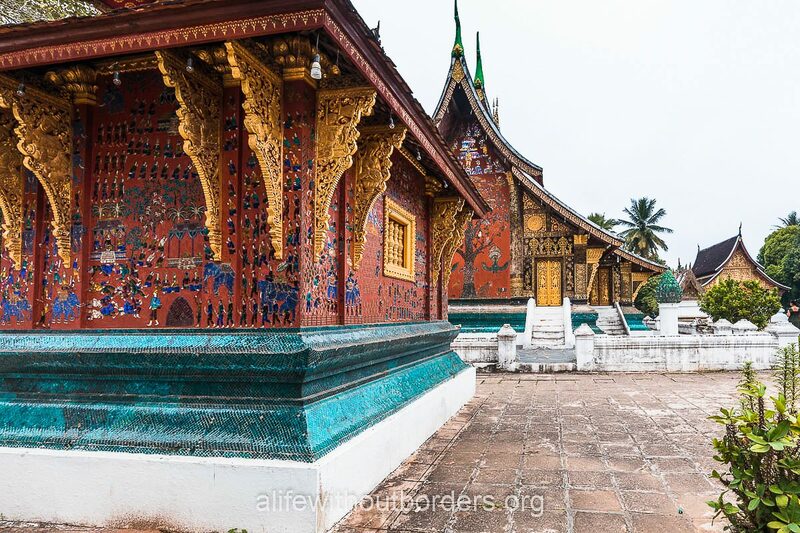 Luang Prabang’s most magnificent temple is Wat Xieng Thong, best known for its stunning “tree of life” mosaic and its dazzling ruby-red chapel but others such as Wat Mai, Wat Khili and the royal temple of Haw Pha Bang are worth wandering the streets to discover for yourself. 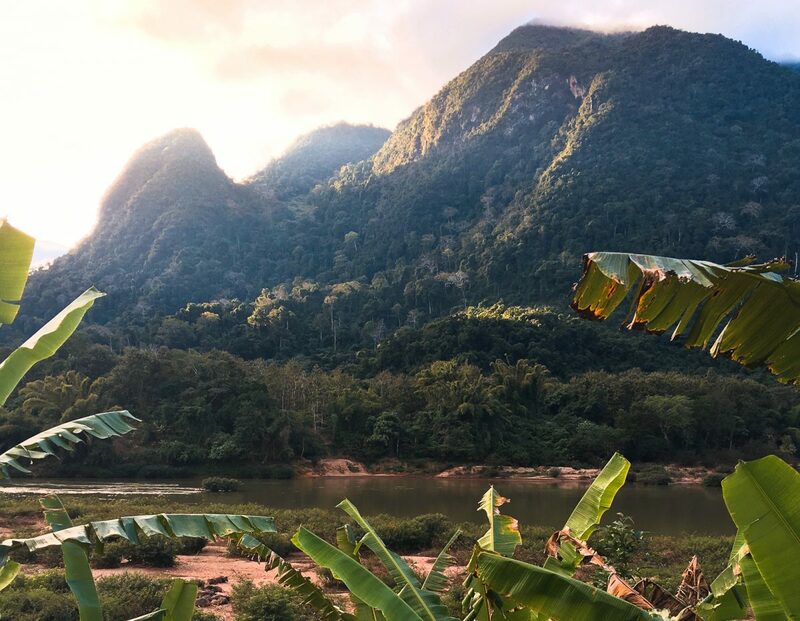 Read more from Marie about Luang Prabang on A Life Without Borders or check her out on Instagram! The Angkor Archeological Park in Cambodia is about as impressive as archeological sites come. The temple complex is best known for Angkor Wat, but is also home to many other Khmer temples and ruins dating back to the 9th to 15th centuries. On the outskirts of Siem Reap, you’ll find the world’s largest religious monument (Angkor Wat), a temple covered in massive all-knowing stone faces (the Bayon) and a jungle temple with trees growing into it (Ta Prohm). While these are Angkor’s most impressive temples, it’s absolutely worth spending a bit more time in Siem Reap and visiting some of the smaller and further afield temples. Once you’ve conquered the Grand Ciruit around Angkor, take a day trip to the small but pretty Banteay Srei or the quieter Rolous Group. 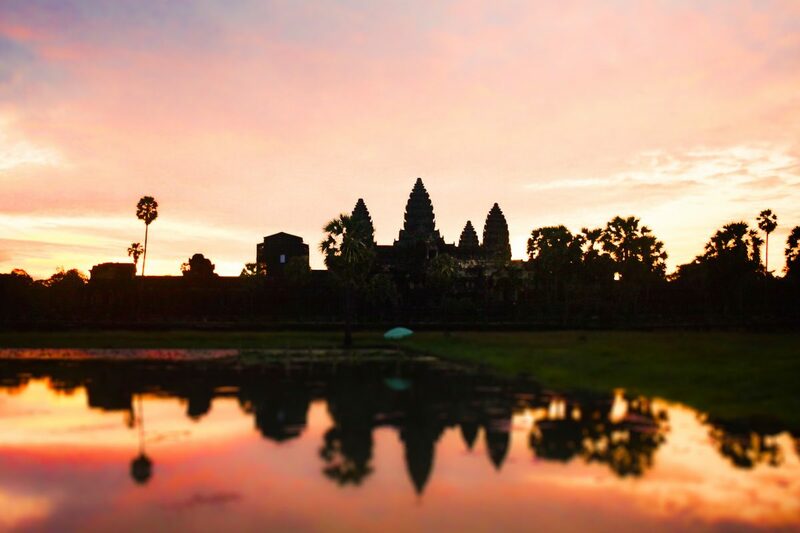 And of course, don’t miss the iconic Angkor Wat sunrise for picture perfect views! Read more from Claire on The Adventurous Backpacker or check out her Facebook! Near the famous Angkor Wat temple is Tonle Sap Lake. There isn’t much unusual about the lake itself except it’s the largest freshwater lake in Southeast Asia and home to a very unique set of people. Rather than living on the lake shore, the whole village floats. It seems a whimsical way to live floating from one area to another, but it does stem from dark roots. The Khmer Rouge genocide and exile left many survivors without the money or ability to buy land, so they moved to where they didn’t need to buy land, the water. Houses are built in clumps, and boats are the main form of transportation, although you will see makeshift rafts and tubs used. It’s a very colorful community, and you’ll see children happily playing as you would anywhere. There are even portable “shops” that are basically just a person in a canoe selling their wares. It’s a fascinating look into the lives of people making the best of their situation in a very creative and beautiful way. Read more from Carly on Flight of the Educator! Backpacking in Southeast Asia is mostly about partying, exploring, relaxing and well a little bit more party. There is nonetheless also a lot to learn history wise. In Vietnam you can visit many museums or sights teaching you about the Vietnam War, a well known war to the world. A less known historic period of time is the Khmer Rouge, happening in the 1970’s in Cambodia. A period of 1975 to 1979 Pol Pot, a radical communist, seized power in Cambodia and killed millions of people. Evidence of these killings can still be found on the many killing fields, with the one in Phnom Penh currently being the most visited by travelers and tourist. While not the most “fun” thing to do, you will learn a lot more about Cambodia’s history and will give you a better understanding of the country. 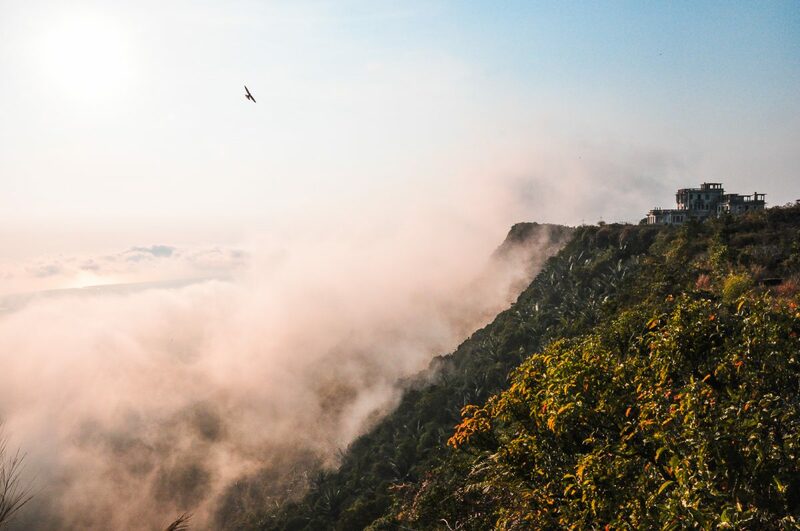 When in the southern part of Cambodia, you should not miss out on a trip to Bokor Hill National Park. While you can easily book a day-trip and go with a group or even in a private car, I can only recommend renting a motorbike and exploring the National Park at your own pace and stop wherever you want to. The roads of about 32km to the top have been recently renovated, which makes the ride up Bokor Hill very enjoyable. Next to the picturesque landscape, winding roads and breathtaking views over the town of Kampot, the countryside and on the coastline, there are a few stops worth making on the way. For example, there is the Popokvil waterfall (most impressive in rainy season), the Black Palace (Damnak Sla Khmao, an abandoned summer palace of King Sihanouk) and the eerie old Catholic Church. Once you reach the top of the hill you won’t only be rewarded by stunning vistas, but also by the abandoned casino that was built during French colonisation in the 1920. To get there, beautiful town of Kampot is a good place to start, as its only about 8km from the entrance of the park. Read more from Laura on Without a Map or check her out on Instagram! While many traveller come to Cambodia mainly to visit the impressive temple complex of Angkor off Siem Reap, this small country has much more to offer. Worth a trip is the picturesque city of Kampot, which is located at the Teuk Chhou river and only about 30 km away from the Vietnamese border. The city offers a laid-back atmosphere, cheap restaurant and bars and a typical little crammed market. 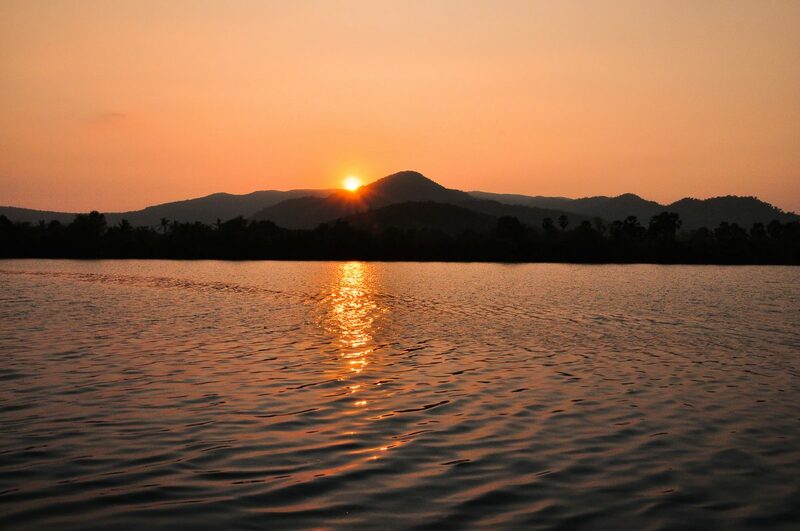 Kampot serves as the perfect start for a daytrip exploring the surroundings. You can either book a whole day-tour by TukTuk or you can rent a motorbike for more independence. The area is especially famous for pepper, namely the Kampot pepper. 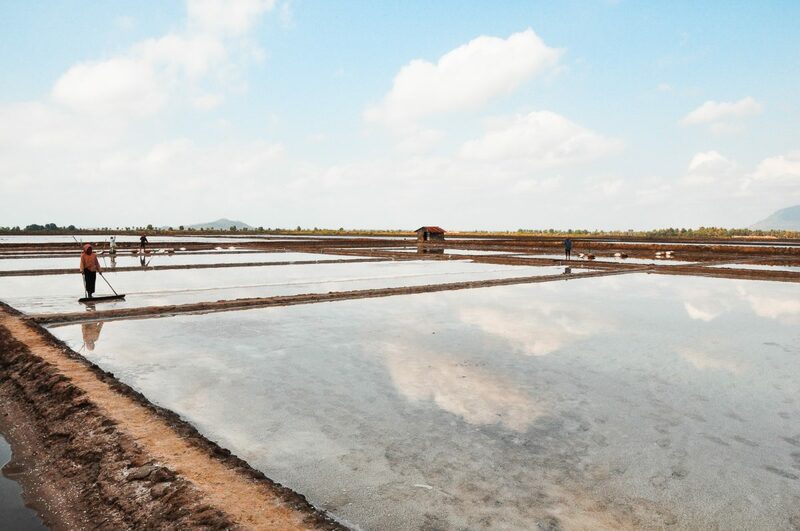 You can visit farms and learn about pepper, see the salt fields or the secret lake, visit the Phnom Chhogok cave or just enjoy the beautiful countryside with its welcoming people. Also, the seaside town Kep with its famous crab market is worth a stop on the way. If you look for something special to do in the evening in Kampot, take a river cruise tour with a boat on the river to watch the mesmerizing fireflies. Singapore, a country like no other, especially not compared to its neighboring countries. This is the country of luxury, the Monaco of Southeast Asia, and you sure are expected to pay the price for it. 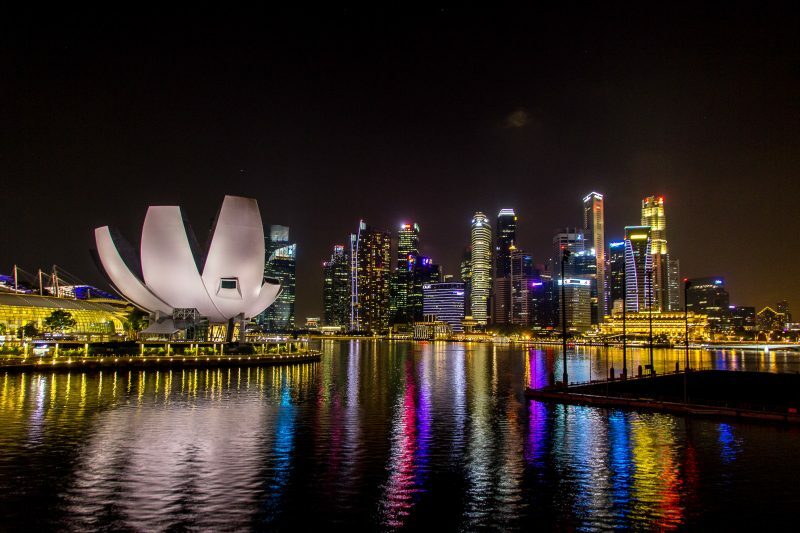 While it is possible to visit Singapore on a budget, it will sure be a lot harder then for example traveling on a budget in Thailand or Indonesia. Nonetheless, a visit is still worth it as there are plenty of free activities, beautiful architecture, and some delicious Singapore food to be tasted. Read here everything that should be on your Singapore bucket list! No skyline in Southeast Asia is as impressive as Singapore’s skyline. Going to Singapore will feel like you have left Southeast Asia and stepped in a complete different world. Prices are 10 times higher, the streets are incredibly clean and suddenly everyone speaks English. And besides all of that, it has one of the most amazing skylines of Southeast Asia. The city is remarkable to see during the day, but really comes alive at night. 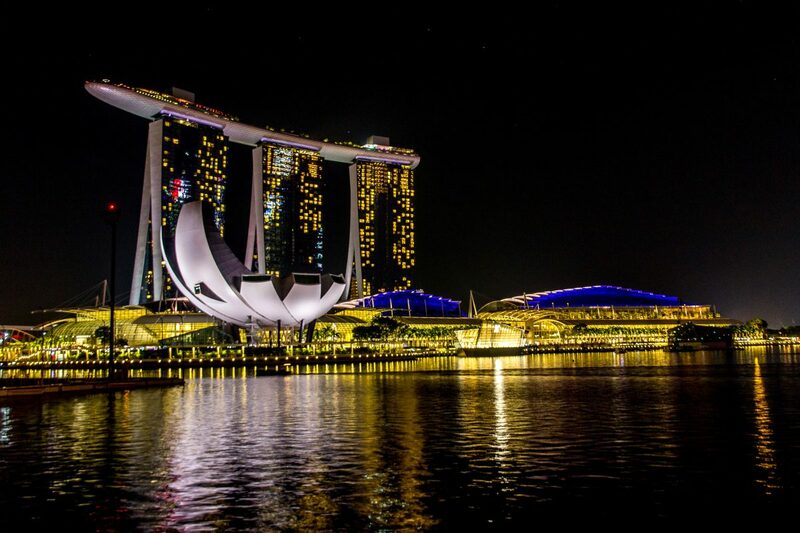 Walk around the Marina Bay to see the light show and enjoy the beautiful lit up skyline, a perfect and simple activity to do if you are on a layover in Singapore! Yes, seeing the skyline might be amazing, but the view from higher up is even better. And don’t try to walk in with your shorts, flip-flops and t-shirt; almost every bar comes with a dress code. Having a drink at a rooftop bar in Singapore is not cheap, but well it isn’t much cheaper in any other bar closer to the ground either, so you might as well make the best of it! Visit the rooftop bars around sun set for an amazing view, or visit it at night to find some of the most amazing and spectacular views you can find over Singapore. While there are tons of rooftops bars to pick from, our personal favorites must be Cé La Vi and Lantern. A visit to Singapore is not complete without a stay at the iconic Marina Bay Sands hotel. Or perhaps I should say, without swimming in the amazing infinity pool, 57 stories up on the rooftop overlooking the city skyline, and to do that, you will need to stay at least one night in the hotel. Spend a day relaxing by the pool, sipping cocktails and stocking up on Instagram photos to be the envy of all your friends. Staying here is not hardship with all the luxuries you know to expect from a five star hotel. Many of the rooms have great views over the Gardens by the Bay too, making watching the nightly light a sound show a real treat. So start saving your pennies, and put Marina Bay Sands on your South East Asian bucket list. Read more from Josie on Josie Wanders or check her out on Facebook! Port Barton is a small coastal village located in Palawan, Philippines. 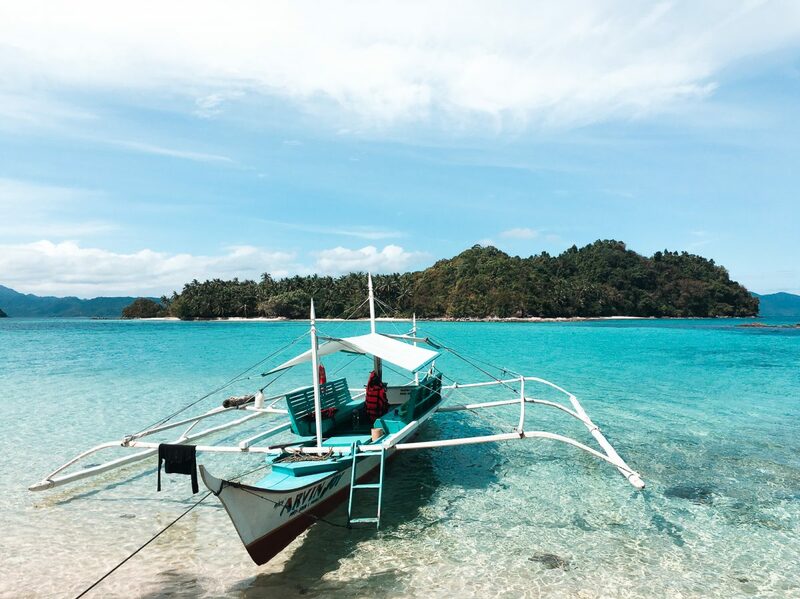 Unlike its neighbor El Nido, Port Barton is still relatively undeveloped and attracts adventurous backpackers who are looking for unspoiled natural beauty. With its pristine beaches, relaxed atmosphere and unsophisticated village, Port Barton is one of the most beautiful destinations in South East Asia. This peaceful beachside village is simple, and a little primitive, there is limited internet and electricity, no banks or ATM. Whether you want to dive, snorkel, go island hopping or simply relax on the beautiful beaches, Port Barton has something for everyone. Don’t miss this gem when traveling to the Philippines, Port Barton will be the highlight of your trip. Read more from Camille on Crafty Explorer or check her out on Facebook! 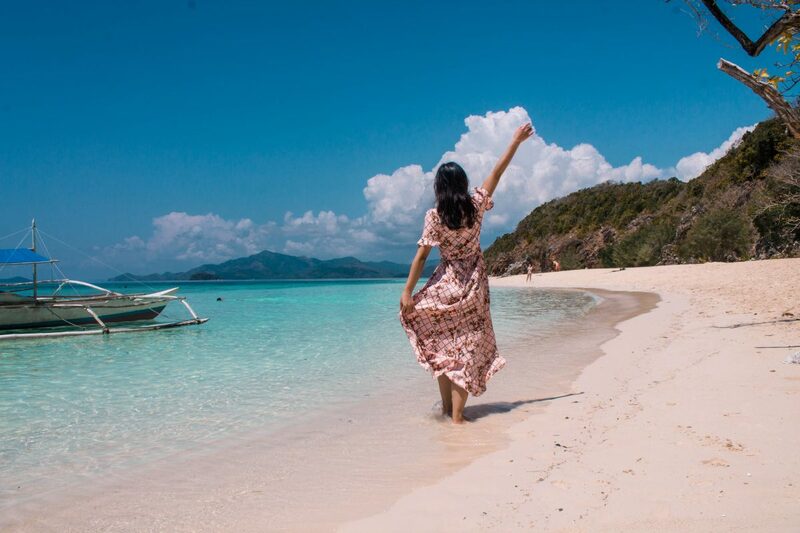 Powdery white sand, turquoise blue water, colorful coral reefs, Coron is the tropical getaway we all need. This island in the Philippines is an absolute paradise and tourists are starting to notice. There are many things to do in Coron. From snorkeling to see World War II shipwrecks, to taking a safari, to simply lying on a secluded beach, you will never want to leave once you are here. The best part is, it is super cheap to enjoy a holiday here. Whether you are traveling on a budget or out to splurge, the island has options for you. So go ahead and put Coron on your Southeast Asia Bucket list. You won’t regret it. Read more from Viola about visiting Coron on The Blessing Bucket or check her out on Instagram! My ultimate bucket list item on our trip to Southeast Asia was getting up close with elephants! But we knew we would only do it if we could find an ethical way – which is where Elephant Nature Park stepped in.Based near the northern city of Chiang Mai, ENP is a sanctuary providing visitors with the opportunity to interact with these incredible creatures WITHOUT harming them! That means that there’s no elephant riding, and any interaction with the animals is completely on their terms, but in return you get a much, much more rewarding experience (and you still get to have totally awesome encounters like bathing them in the river and watching families!). Most of the elephants have been rescued from tourism and logging industries, so it’s great to feel confident that instead of supporting these companies, your money is going towards happy-ever-after lives for these elephants. If you’re looking for an ethical bucket list animal encounter in Asia, this is one of the best! Read more from Clarissa on volunteering at the Elephant Nature Park at An Orcadian Abroad or check her out on Instagram! Kanchanaburi is a small riverside town a few hours outside Bangkok. It’s a convenient day trip, though I recommend you spend the night to experience the highlights! One of those highlights is the bridge in town. Specifically, it is the famous bridge on the River Kwai. World War II history, including this bridge and the railroad built by suffering POWs, is a huge part of Kanchanaburi’s intrigue. They have a huge POW cemetery and sobering museum. After visiting the museum, you can catch the train in town and ride through the jungle, on the very tracks which cost so many lives to build. The other reason Kanchanaburi deserves an overnight stay, however, has to do with elephants. 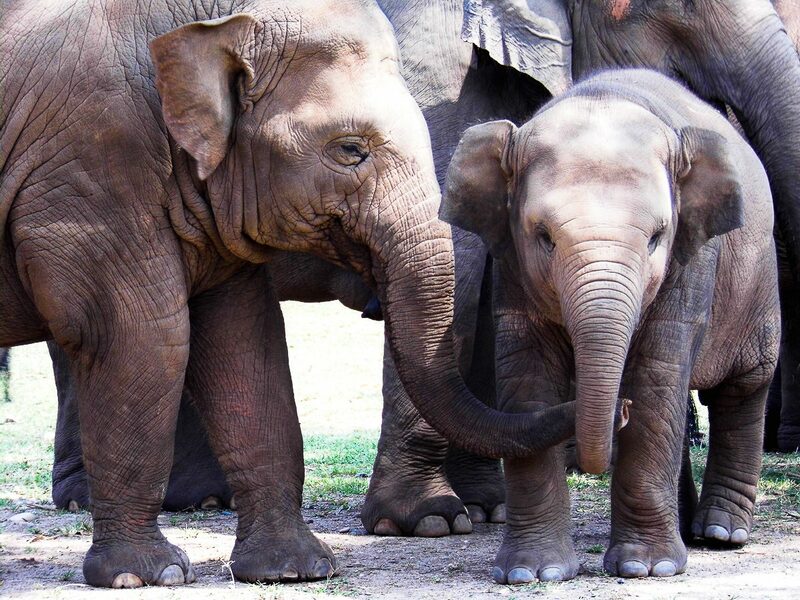 There aren’t many humane elephant sanctuaries in Thailand, but one of them is in Kanchanaburi! Visiting Elephant’s World is an incredibly rewarding, educational, and uplifting experience. It is the perfect way to end your Kanchanaburi trip.Kanchanaburi, Thailand, is an unexpectedly enriching destination, which belongs on any history buff or animal lover’s bucket list! Read more from Kaisa on Glam Granola Travel! 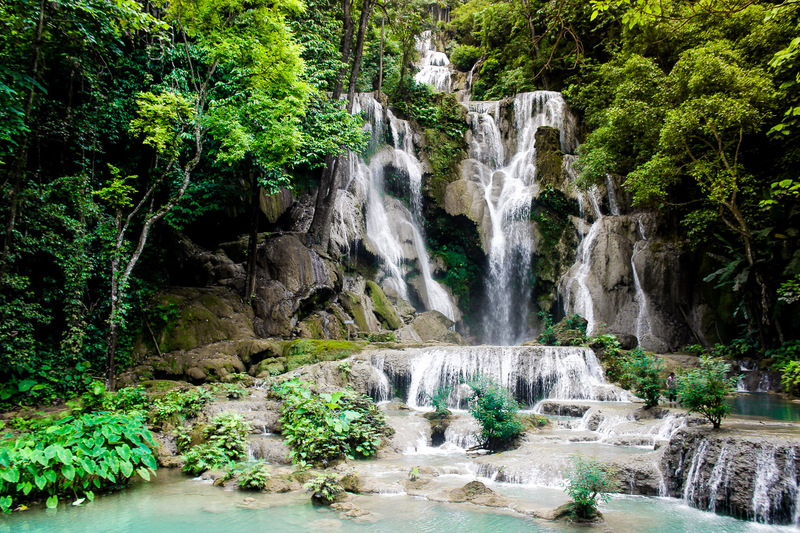 Although not that well known, the greatest set of waterfalls in all South East Asia are in Thailand. These are the Umphang Waterfalls (or Thi Lo Su). This magnificent site is located in the North of the country and very close to the border with Myanmar. It is only possible to visit with an organized trip and these often include a few days of jungle trekking. And the whole experience is simply amazing. You can camp next to the waterfalls and rise with the birds chirping. Although it can all be a bit rough: don’t expect hot water or electricity. To complete the experience, if you don’t visit during the rainy season, you can spend a few hours soaking and swimming in one of the waterfall pools. Read more from Jenn on The Solivagant Soul or check out her Twitter! The beaches of Thailand are known to be looking like a true paradise, from exploring the stunning beaches of Kao Sok and Koh Samui, to the beautiful island of Koh Phi Phi, the Thai islands look like they came straight out of a beach vacation magazine. But you can also explore a completely other world when visiting the Thai islands, by taking a dive into the depth of the ocean. If you have always dreamed of learning how to dive, Southeast Asia is the place to do it. Koh Tao, Thailand must be the most well known and cheapest locations in Southeast Asia to get your PADI, something that every adventurer should add to his or her Southeast Asia Bucket List! Royal Grand Palace Bangkok is the most magnificent building complex in Thailand. It was built as the official residence for Thai kings in 1782 on the banks of the Chao Phraya River. 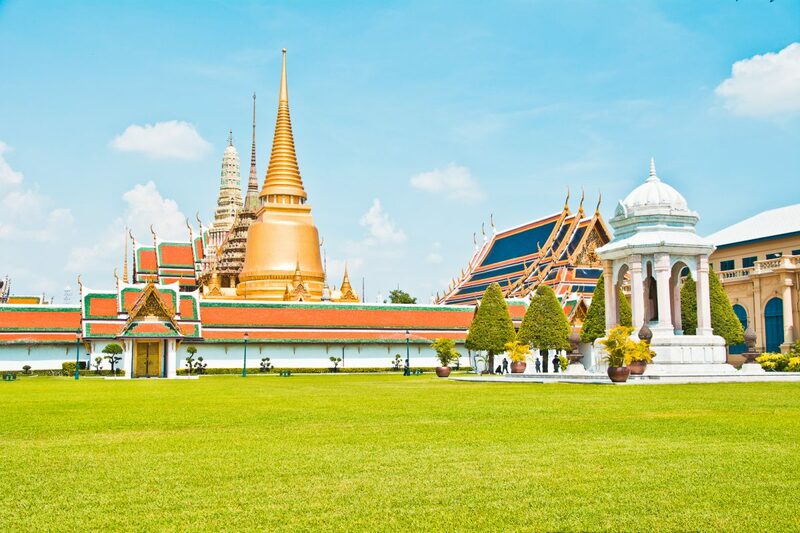 The Grand Palace is not a single structure; it is made up of numerous buildings, halls, pavilions set around open lawns, gardens, and courtyards. A part of the palace is opened for the public and the royal official as an office uses other part of it. The Temple of the Emerald Buddha is the most important building in the Grand Palace. Other important buildings are the Outer Court, the Middle Court including the Phra Maha Monthien Buildings, the Phra Maha Prasat Buildings, the Chakri Maha Prasat Buildings, the Inner Court and the Siwalai Gardens quarter. Now Grand Palace is used for royal ceremonies and represent as a symbol of monarchy. Read more from Sapna about exploring Bangkok on My Simple Sojourn or check her out on Pinterest! The girl next to me is whimpering as a giant train thunders centimetres past our feet. I’m too excited to whimper – I’ve wanted to come here for years and now, I’m finally standing by the tracks. 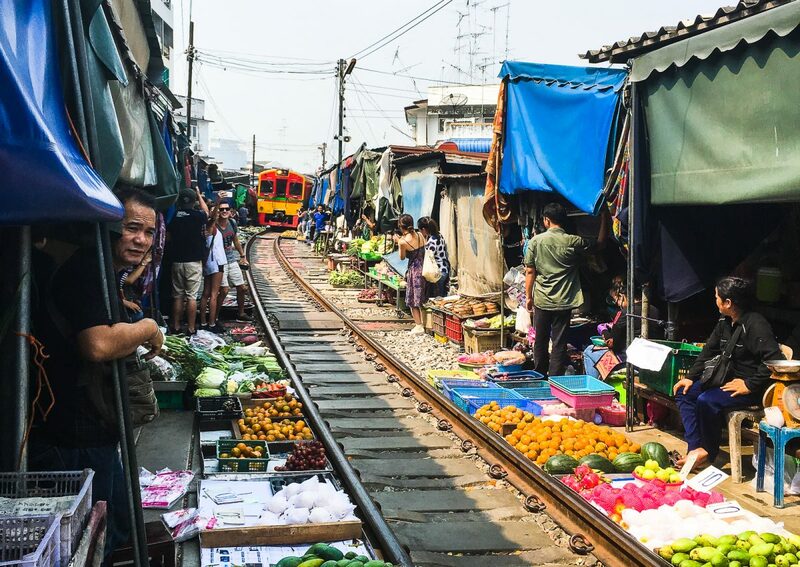 Located 80 kilometres south of Bangkok, Maeklong Railway Market is a normal market aiming at the locals who come here to buy fruits, vegetables, fish and the other daily essentials; it just happens to be set up alongside the tracks of a working railway. So, eight times a day when the local train thunders through the middle, the stallholders simply pick up their stock, pull in the sunshades they use to give themselves cover and let it through. It’s a fantastic insight into Thai life, how they’ll just get on with things no matter what. Plus, the bragging rights are pretty cool too! Read more from Helen about how to get to the Maeklong Railway Market on Destination Differentville or check out her Facebook! Koh Phangan is THE party island of Thailand. Never heard of it before? Maybe the term Full Moon Party rings a bell. Koh Phangan is where to the Full and Half moon parties happen every single month, taking place on the beaches and in the middle of the jungle of the island. Backpackers from all over Southeast Asia fly out to Thailand for these parties! Can’t make it to the islands? Be sure to check out Khao San Road instead, which is known as Bangkok’s backpackers paradise. Shopping, eating and partying, you can do it all at Khao San Road! One of the most memorable travel episodes I’ve had is riding a scooter from Chiang Mai to Pai (and back) along Northern Thailand’s twisty mountain roads. It’s a trip that can be done by cramped minivan if you prefer, but there’s nothing quite like feeling the wind in your face as you traverse the 135km route with its 762 curves. Although I wouldn’t recommend trying such a long journey if you’ve never ridden a scooter before, you don’t need to be hugely experienced to safely complete it. I wasn’t and I’m still here to tell the tale. It’s not a race so take it steady and employ a lot of common sense in your riding. Stop to enjoy the scenery whenever it presents a highlight, which it often does, and arrive knowing you’ve just achieved something that will be on many other travellers’ Southeast Asia bucket lists too. Read more from Lee about riding a scooter from Chiang Mai to Pai on My Favourite Lens or check out Lee’s Instagram! The mountainside temple of Wat Phra That Doi Suthep is a must-do for any visitors to the northern Thai city of Chiang Mai. Sitting atop a mountain of 1676 metres altitude, the temple is thought to house a piece of the Buddha’s bone, and was built for this purpose in the 1300s. Visitors can enjoy strolling around the complex and its ornate Buddhist architecture as well as visiting the places of worship. There is also a lookout with a spectacular view of the city and surrounding area. For those who wish to get even more in touch with the temple and Buddhism, Vipassana meditation courses are available at the attached centre. These courses, while strict (there is no talking, reading and use of phones is prohibited and eating is not allowed after 12 noon!) are a fantastic way to learn about Buddhism and practice mindfulness. The temple is easily accessible from the city by taxi or collective truck. Chiang Mai is commonly reached from Bangkok, either on the overnight train or by flying. Read more about taking the train to Chiang Mai on Claire’s Footsteps or check out her Instagram! Last, but definitely not least, climb the tiger temple in Krabi. No there are no actual tigers at the top, but the view is worth the climb. It is not an easy climb, over 1200 steps to the top, but trust me it is so rewarding when you finally reach the top! 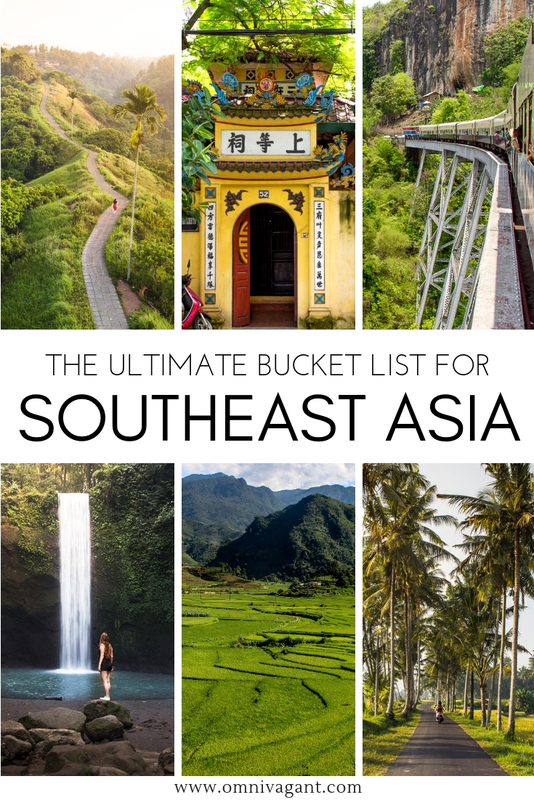 So there you have it, 25+ things to do, the ultimate bucket list for Southeast Asia! Have you been to Southeast Asia? Tell us in the comments below what your favorite thing to do was. Oh, and don’t forget to pin it! I learned my PADI in Borneo, such a great achievement. Also love the Singapore skyline, the Merlion and the views from the quays, lovely with an ice cold Tiger beer! Diving in Borneo must have been amazing! And yes, I would give anything to enjoy that view right now! Thanks! I did my best, there is so much to see and do in Southeast Asia, I can’t wait to go back! I love this post! Southeast Asia seems like a beautiful place to visit. Singapore is gorgeous and I loved having drinks at their rooftop bars. The drinks are a bit pricey but so worth it! Yes, the drinks are quite pricey, but I thought it was worth it for the view! wow. one hell of a bucket list ! I’m deff saving this to my favorites for when I visit! I like how you included a little bit of everything. I can’t wait to see the rice fields and waterfalls, as well as the rooftop bars of singapore 😉 Thanks for sharing! Thanks, I tried to include as much of variety as I could, I mean that is all Southeast Asia is about. Definitely a recommended journey, enough to see and to do there! We’re headed to Thailand in February, so we might have to check out some of these other places you’ve got listed 😉 Thanks for the tips! Amazing, I loved Thailand! I’ll hope you’ll have a wonderful time! This bucket list is giving me some serious wanderlust day dreams about traveling in Southeast Asia. I already want to visit for the food, but now I want to check off many of these activities, too. 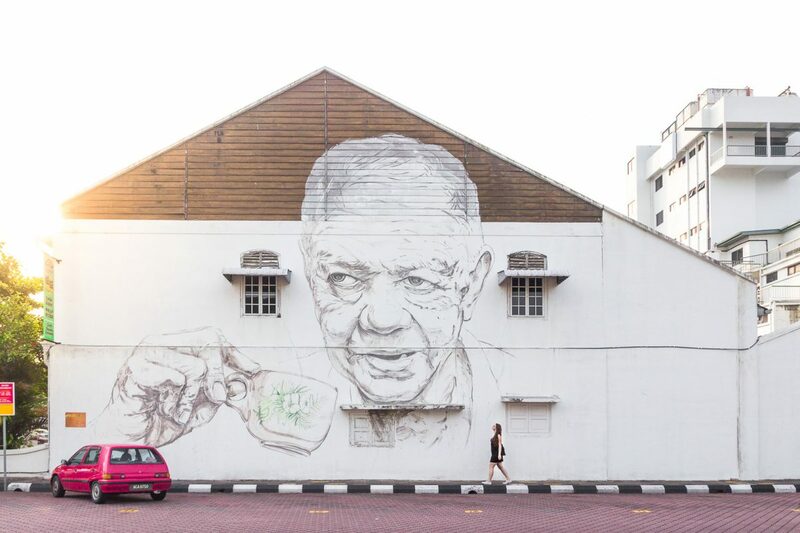 I’d love to see the street art in Penang and sip a cocktail at a rooftop bar in Singapore! Oh the food, I totally forgot to mention the food. Nothing tops Thai Street Food, delicious Vietnamese coffee or a good coconut curry! I love all of your photos! I have never been to Asia but am saving this for later! Thanks! Hopefully one day you will, such an amazing place! I love bucket list, and always adding more to mine! I’ll be sure to add a few of these. They look fun! Thanks Becky! I love bucket lists too, mine starts to get a bit long now though haha. Glad you liked it! I’ve only been to Singapore so far and I definitely regret not having drinks at a rooftop bar. Been dying to return for a trip around Southeast Asia ever since and seeing your beautiful photos just make me wanna book a flight there ASAP. Will for sure keep this bookmarked and thanks for the awesome recommendations! Thanks Jas! There are so many of them! I didn’t have drinks the first time I was there either, but the second time I was there I just couldn’t get enough of it haha. I must have been to 7 rooftop bars! What an awesome comprehensive list!!! I’m definitely adding some of these to my bucket list. I’ve never seen Umphang Waterfalls before. Beautiful! Thanks Yana! I hope you get to see all of your bucket list items soon! Love this post! 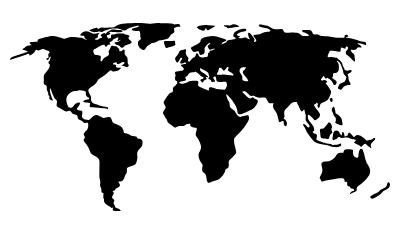 I’ve been to most of these countries, but there were still so many places I’d missed. Thanks Julie! It is so easy to miss things, just a good reason to revisit the country again one day soon! That’s a really comprehensive bucket list! I’m seeing those pictures and consulting flights at the same time <3 so beautiful! Hope to someday go backpacking around Asia! Thanks Bruna! 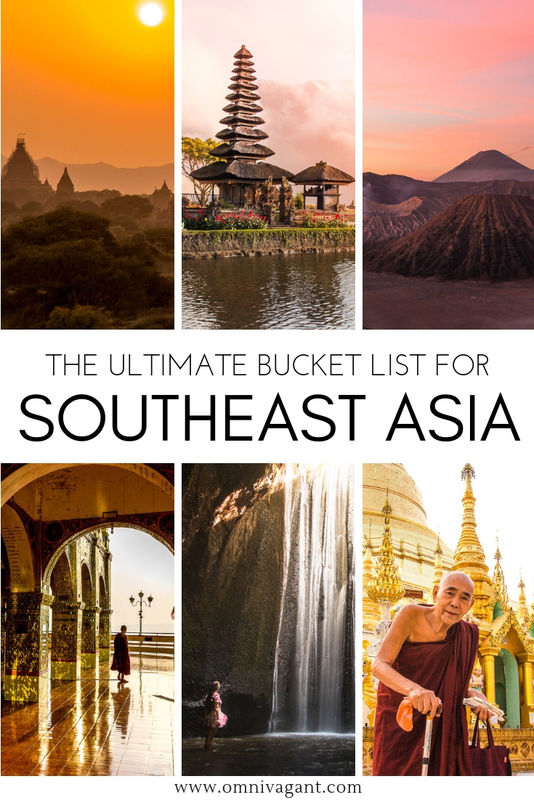 Southeast Asia is such a beautiful place, I hope you get to see all of these bucket list items one day for yourself!